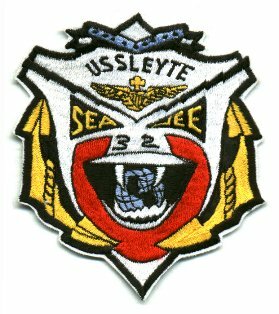 "I was stationed aboard the USS Leyte for just about all of 1952. 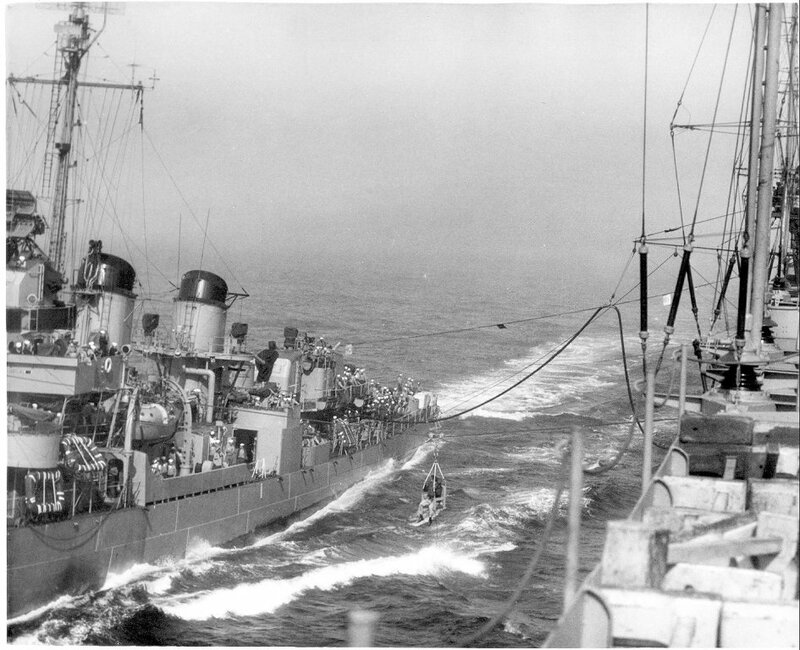 The ship did some operations off the East coast and made a cruise to Nova Scotia with a load of Naval Academy cadets and in mid year we left for a deployment in the Mediterranean. 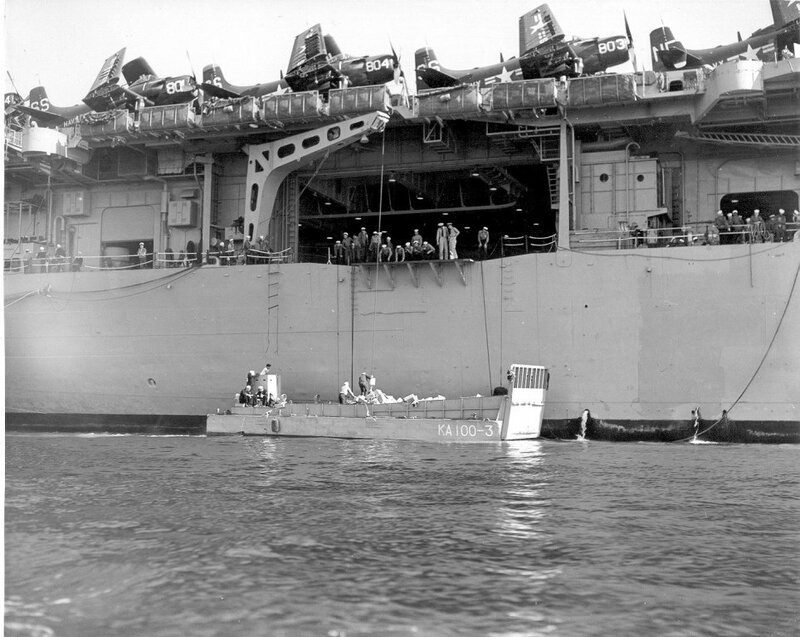 I left the ship in mid December to travel back to Norfolk in time to be discharged a few days before Christmas 1952. 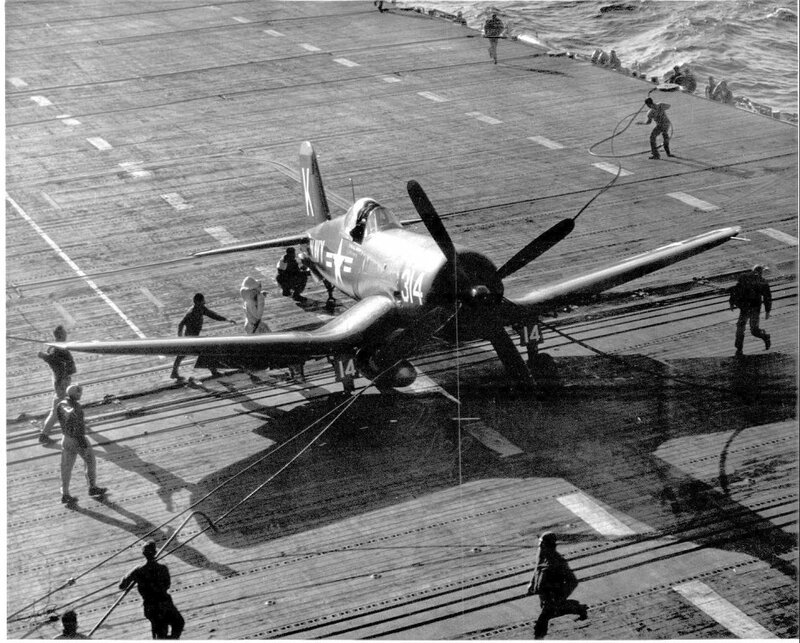 My job aboard the ship was to man a station on the starboard side of the flight deck about where the second wire was located and photograph anything unusual that was happening. 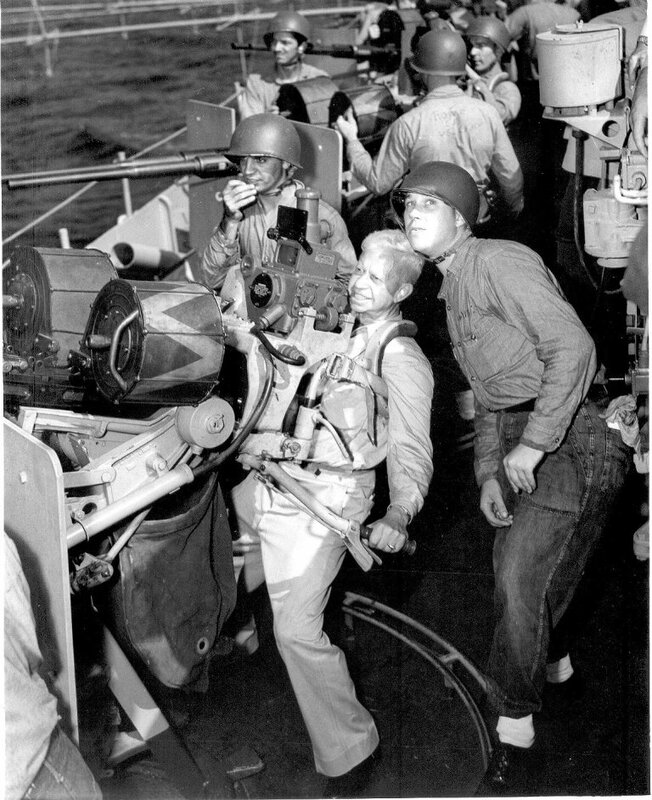 There were other camera positions that were also used. I took some of the photos [shown here] and I saw many of the events that were photographed, but obviously I wasn't always in the right place to get the shot." 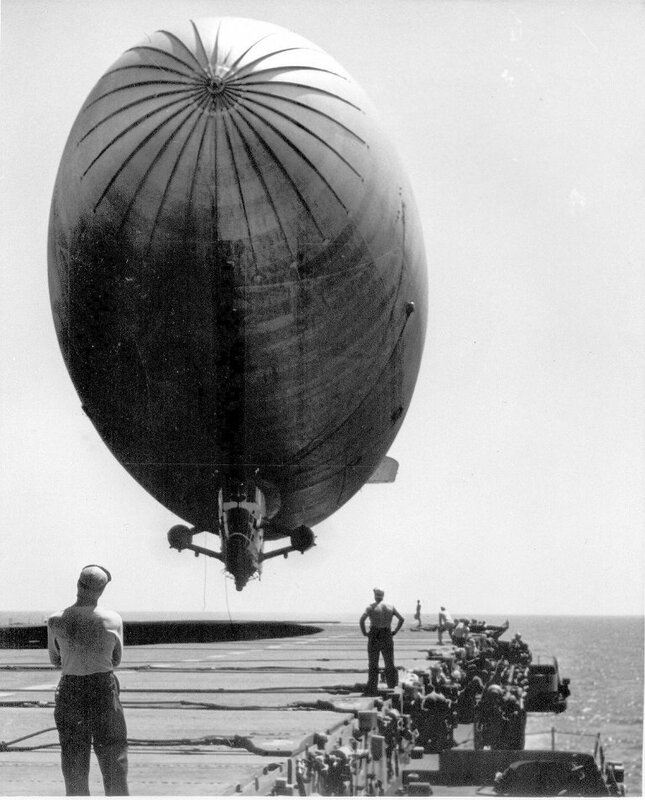 The aircraft landings were shot with a 4"x 5" hand held, electrically driven camera. It was the same camera that in later years became known as the "machine gun camera" and was used by many sports photographers. 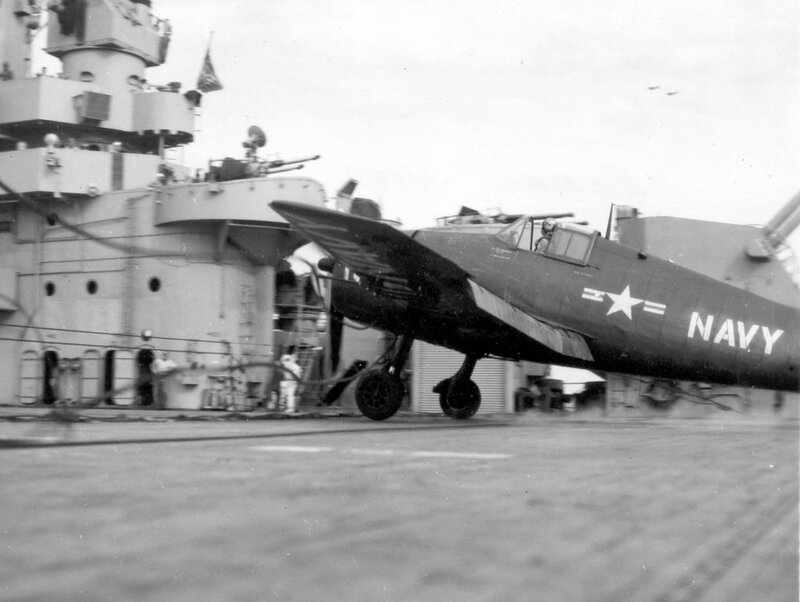 An F6F-5N Hellcat going into the barrier. 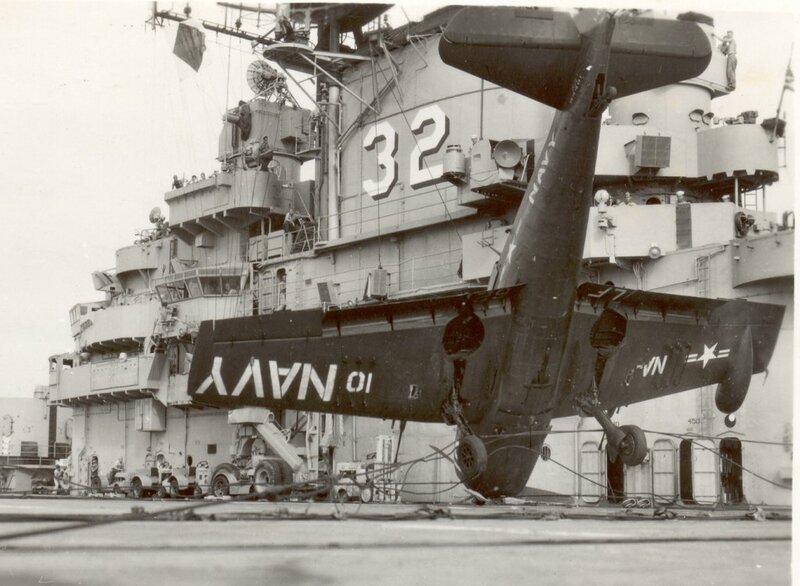 If you look closely you can see that the hook is missing from the tailhook assembly. 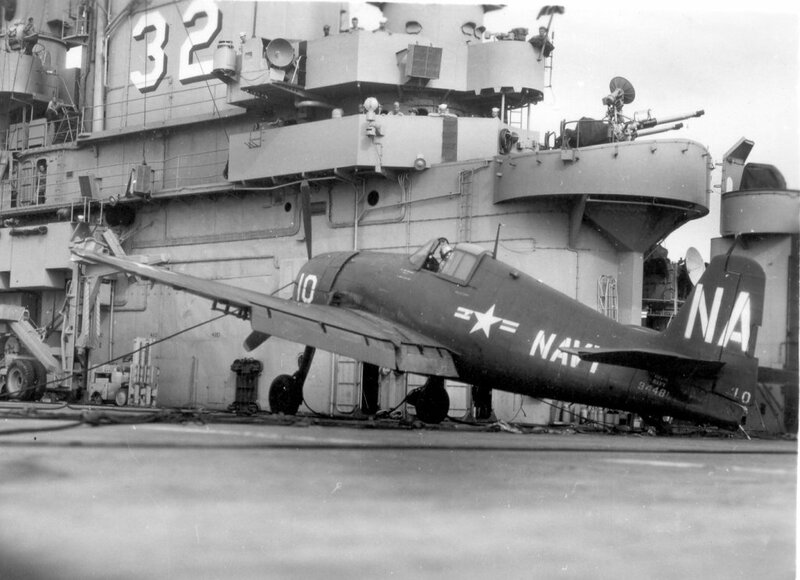 I don't know how that occurred but it caused this pilot to have an exciting landing. 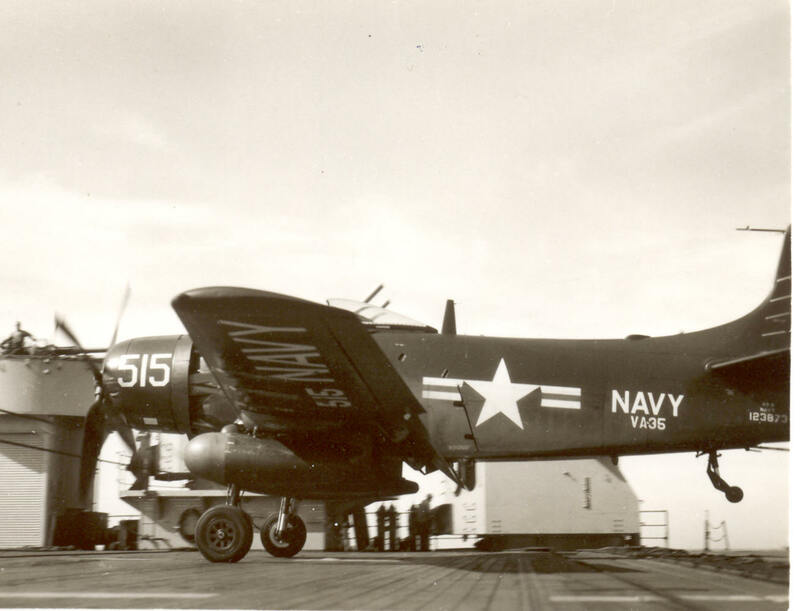 The plane, BuNo 94481, was assigned to Composite Squadron 4 (VC-4), "Nightcappers." Man jumping. 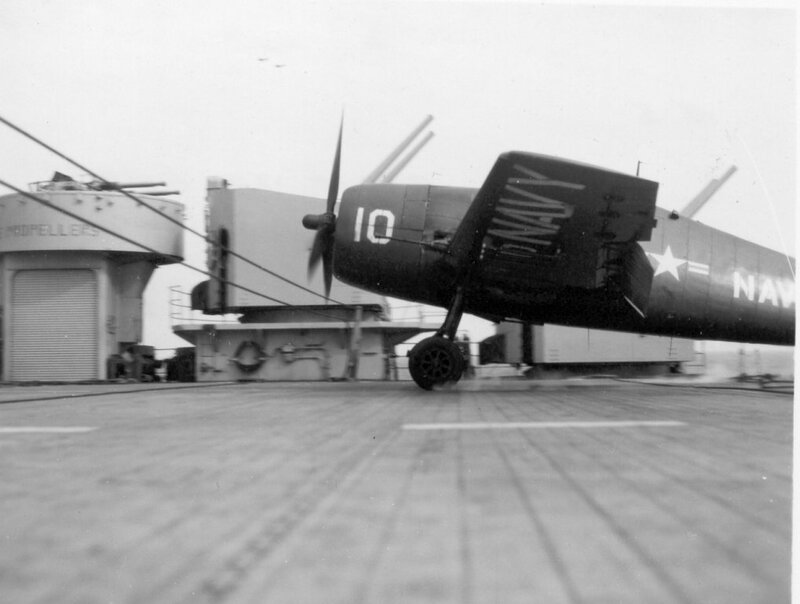 Note broken tailhook. Coming down. He walked away! Plane hit barrier at about 80 mph. Time to celebrate. The end. 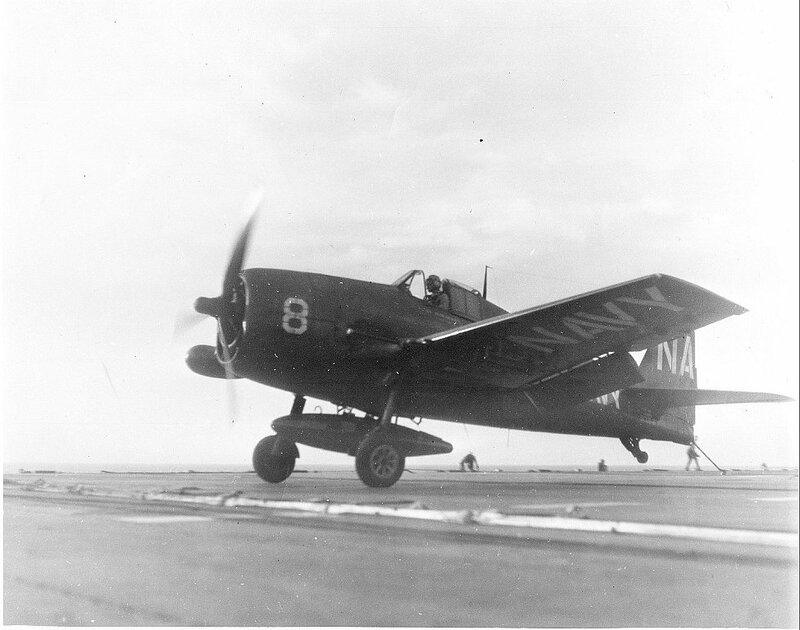 F6F-5N Hellcat #8. This plane went into the barrier. 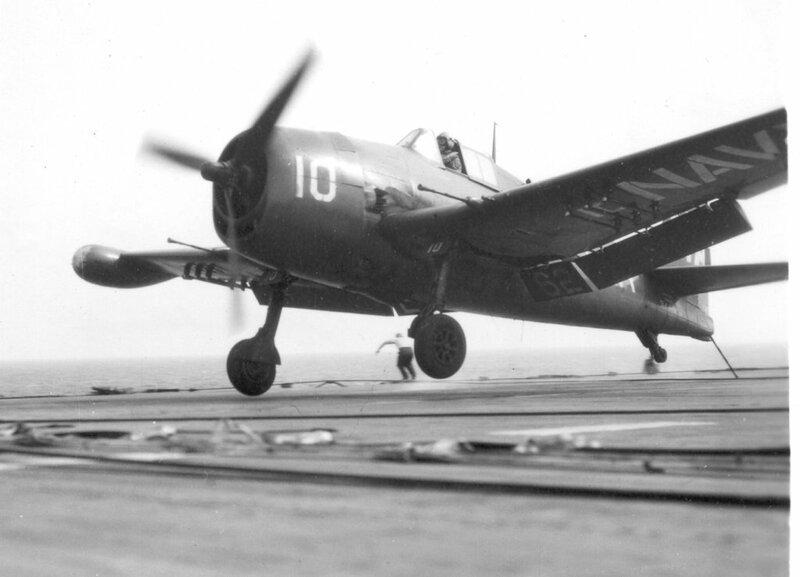 Four of these planes came aboard at sea. In two days three of them hit the barriers. The other guy flew home. 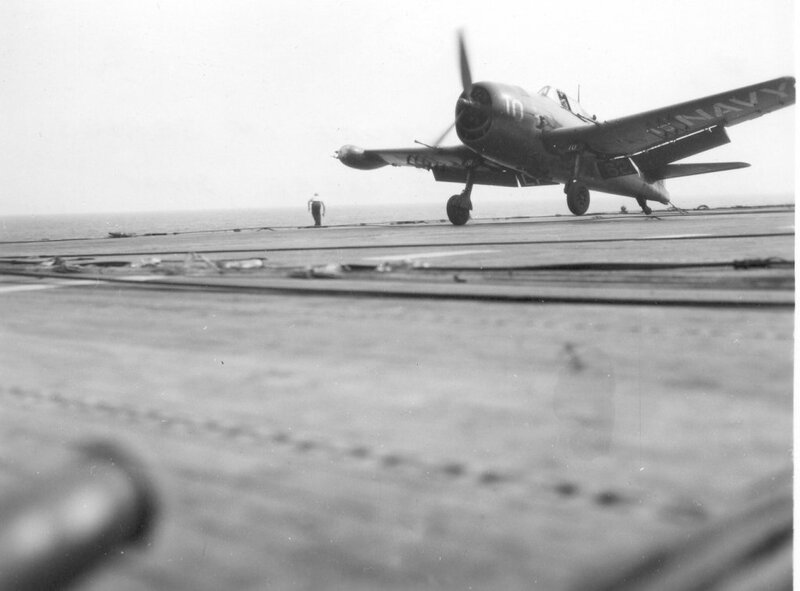 A series of eight photos of an AD-4 that caught a late wire and went into the barrier. There wasn't much damage aside from dents and scrapes so that was a fortunate occurrence. 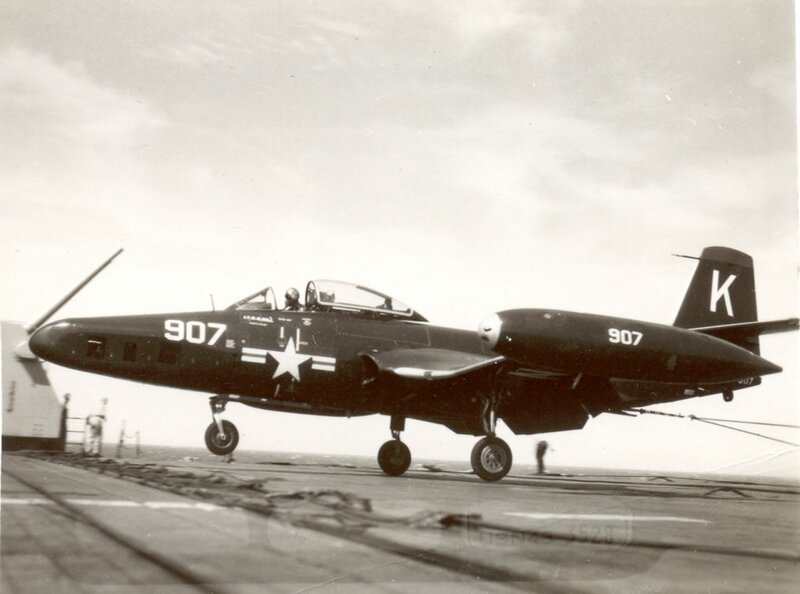 The plane, BuNo 123873, was assigned to Attack Squadron 35 (VA-35), "Black Panthers." 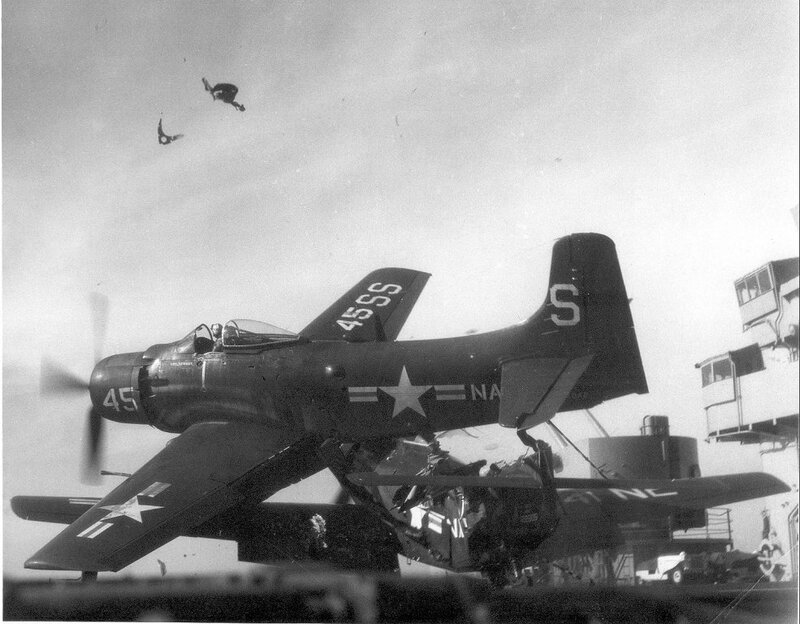 AD Skyraider of VC-33 squadron (#SS-45) hits parked Skyraider of VC-12 squadron (#NE-41). 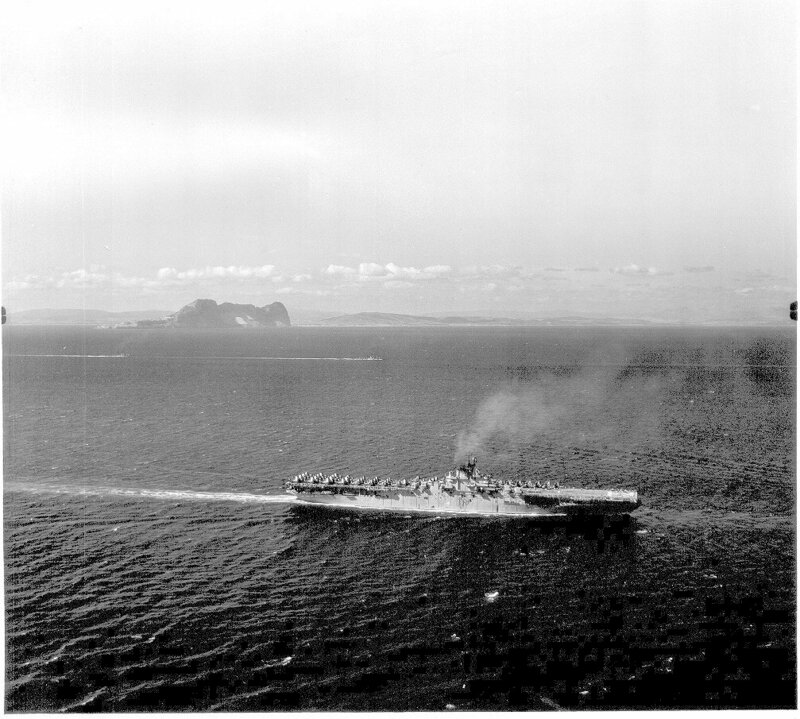 Sometime between 6 September 1950 and 3 February 1951 (WestPac & Korea cruise) (Thanks to Niels Dol for the information). 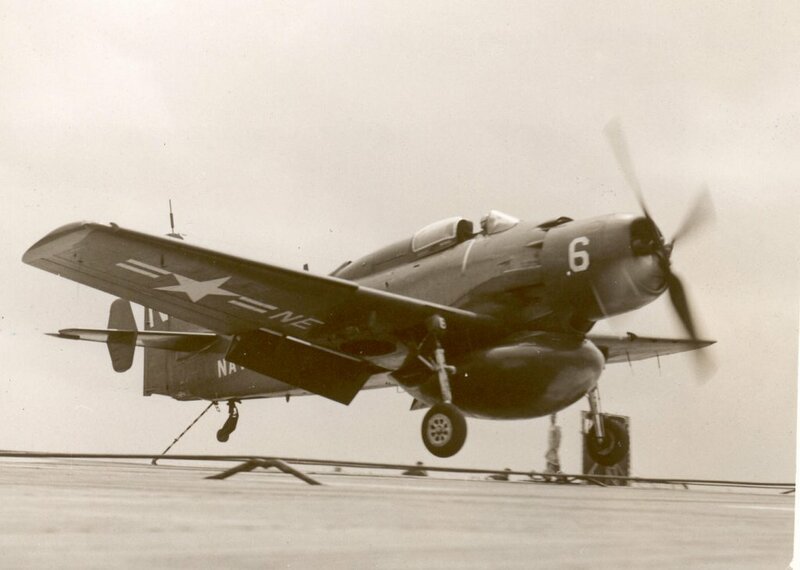 Fred Osborn, however, comments: "I was aboard CV-32 (USS Leyte) as a member of VA-35 from early 1950 to early 1951 except for a 10-day period in Sept. 1950 when the Leyte was in drydock. 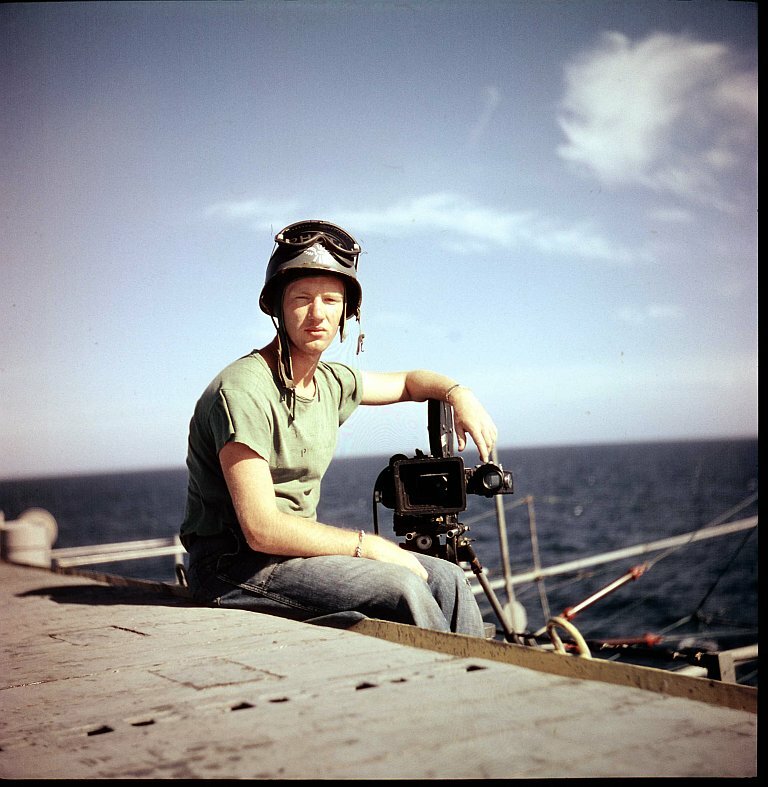 This included a Med cruise and the Korean operation. 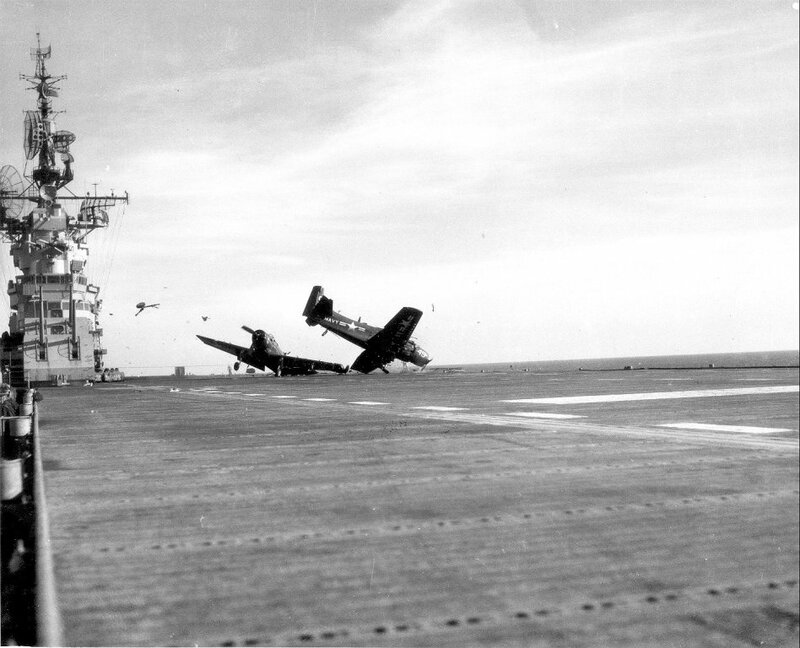 I have no memory of any accident where a VC-33 AD hit a VC-12 AD parked on the flight deck." 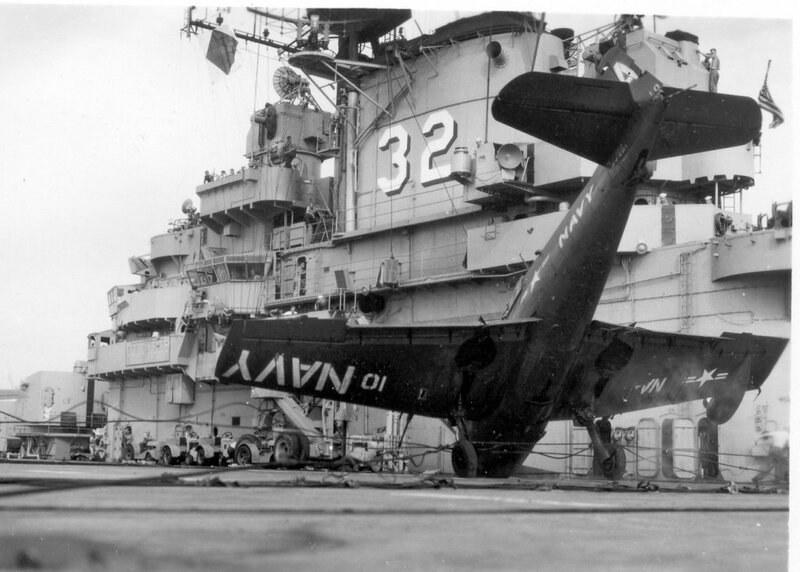 "AD-3 (122805[, NE41]) of VC-12, gets chewed up by a landing AD-4Q (124042[, SS45]) of VC-33 on board USS Leyte. 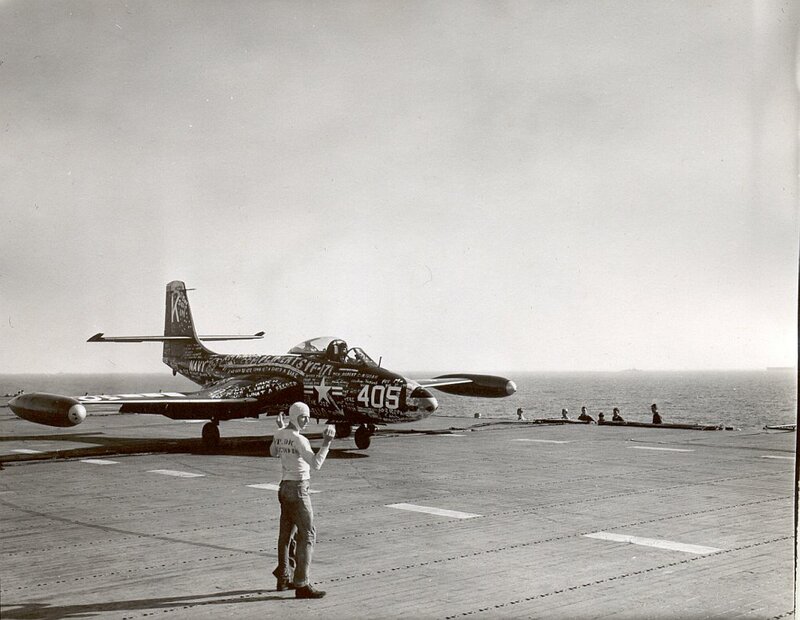 Both aircraft suffered strike damage, and one of the pilots was killed. 14 January 1952." 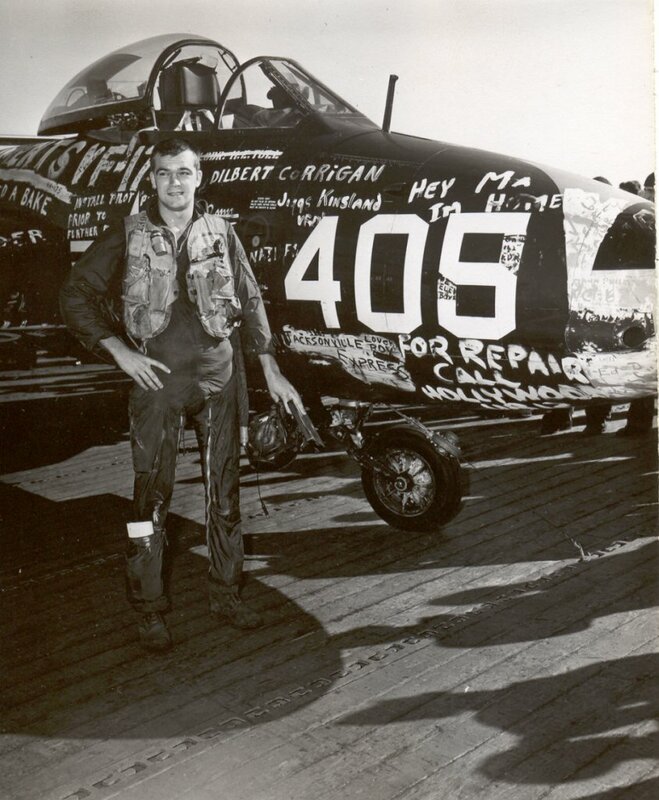 Jim Sullivan, Skyraider in action (Carrollton, TX: Squadron/Signal Publications, 1983), 21. 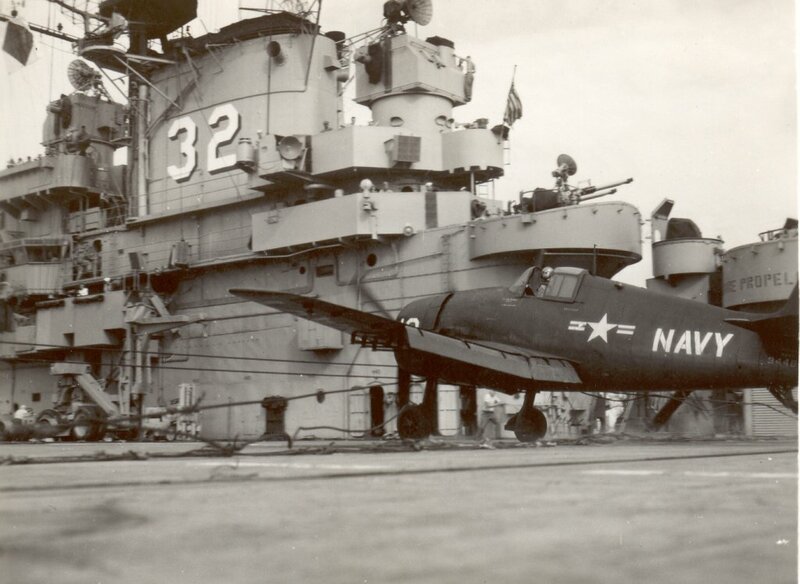 This pilot of an F2H-2 Banshee of VF-34 landed on the wrong ship after an exercise. The next day he came home after a rousing sendoff from the other ship. Latter part of 1952. 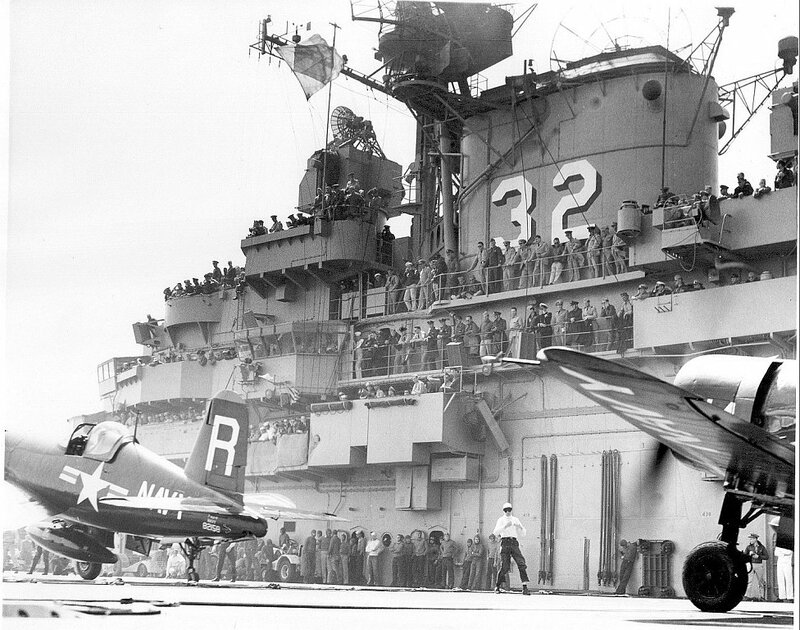 In all probability the "other" carrier was USS Franklin D. Roosevelt. 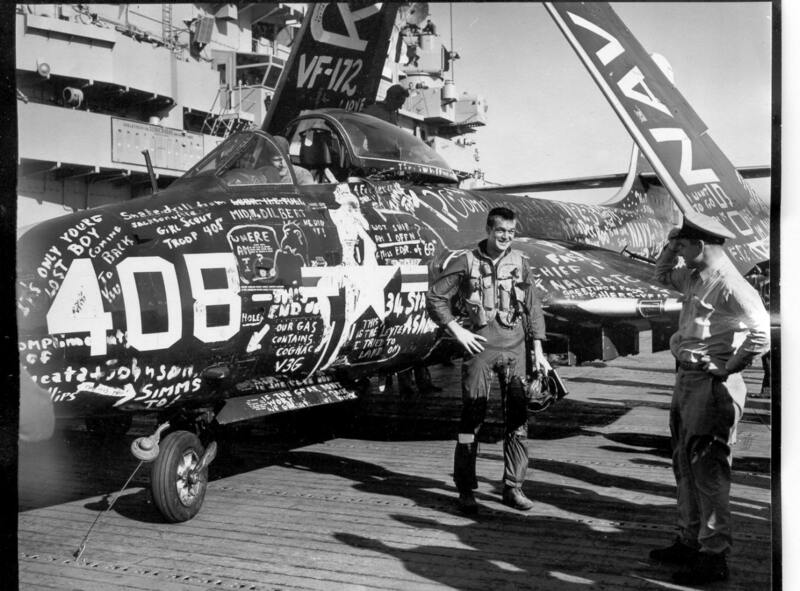 VF-171 and -172 were the Banshee squadrons aboard FDR at that time. 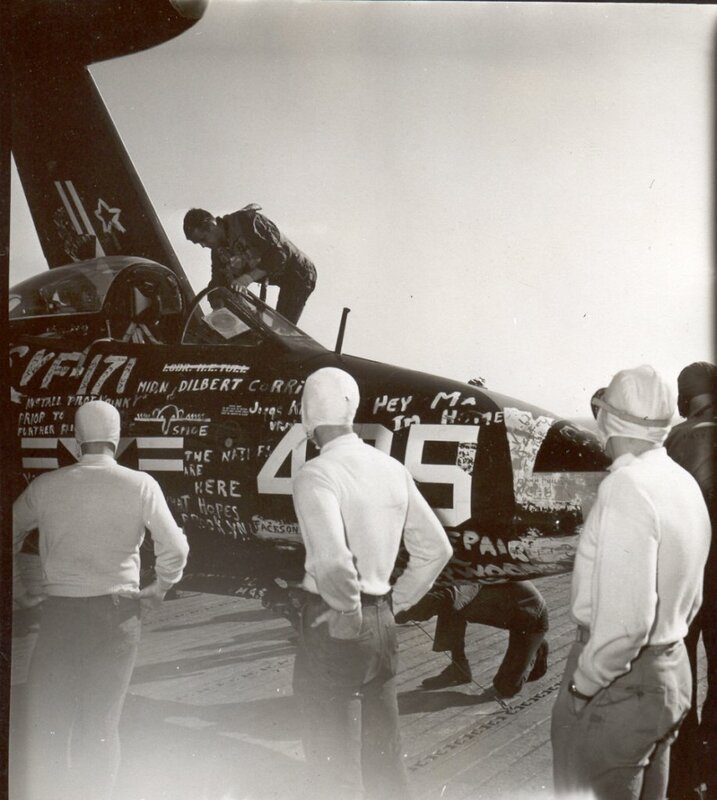 Even Leyte's Air Group 3 tail code ("K") was repainted to look like that of FDR's Air Group 17 ("R".) And if you read the graffiti you'll find references to "Miss FDR" and "FooDeeRoo" (a nickname of Franklin D. Roosevelt). 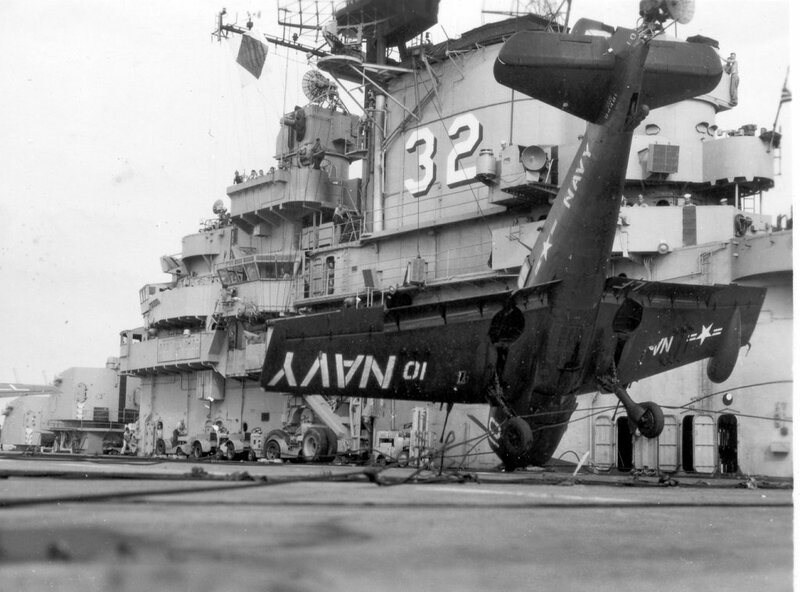 This Sikorsky HO3S-1 Dragonfly helicopter was assigned to HU-2, "Fleet Angels," squadron. 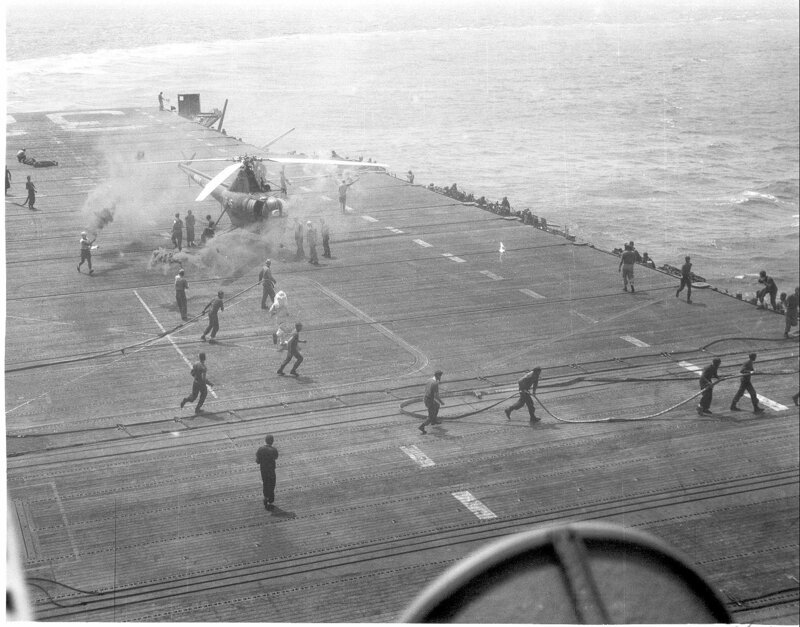 Looks like they are holding a flight deck fire drill: note the smoke grenades that they are using to simulate fires. 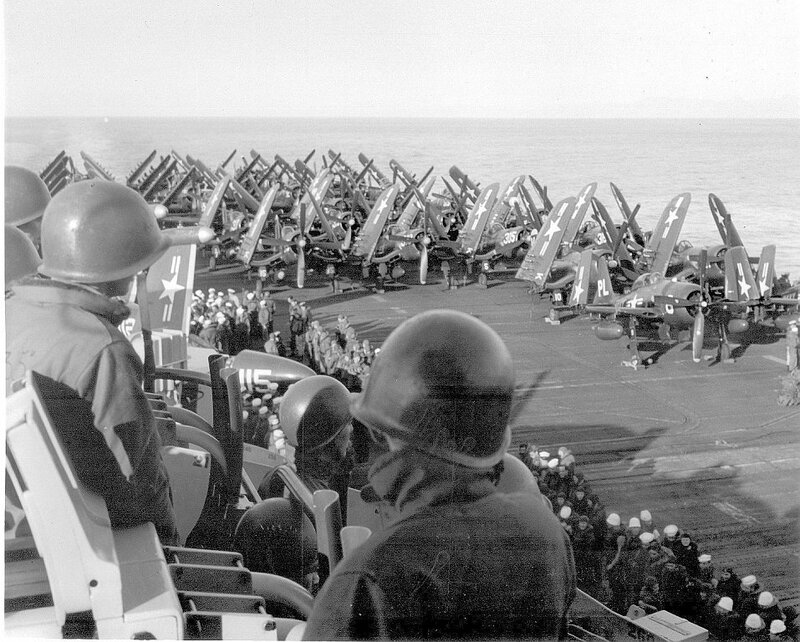 A group of AD Skyraiders getting ready to be launched. 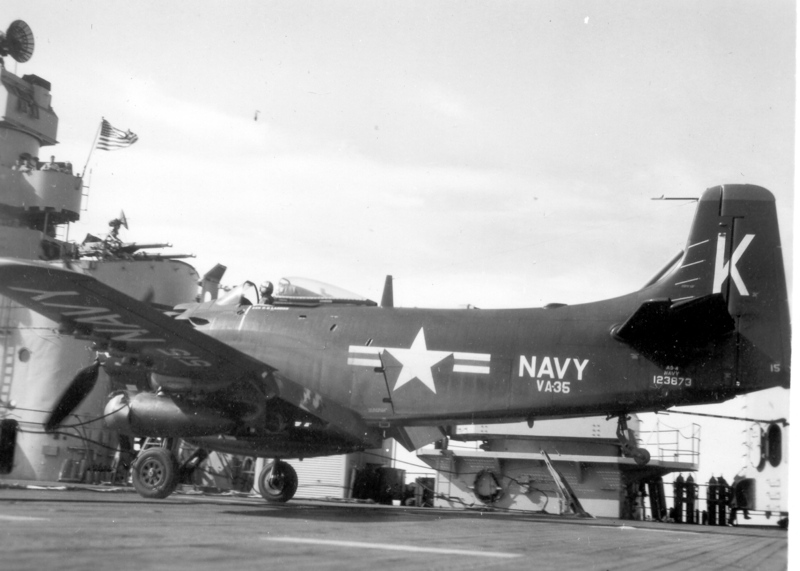 These planes were assigned to Attack Squadron 75 (VA-75) "Sunday Punchers," part of Air Group 7 (CVG-7). 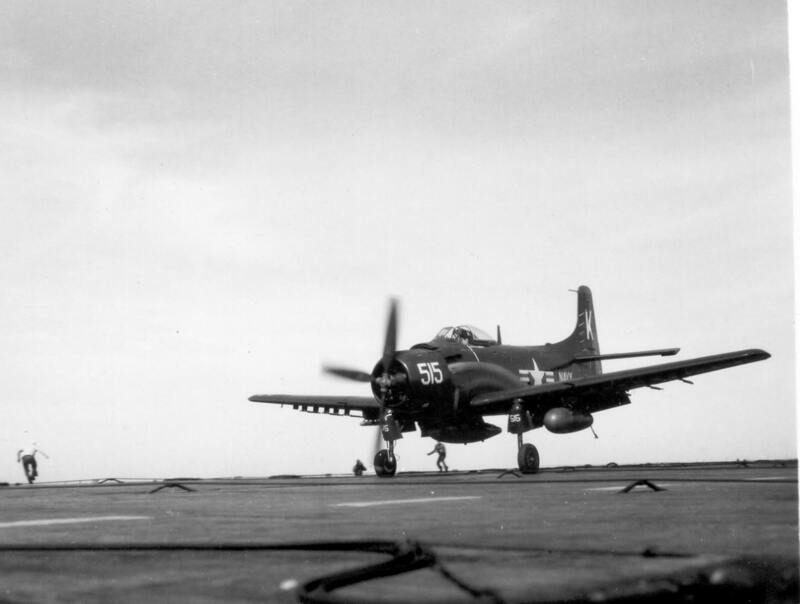 AD-4 Skyraider BuNo 123856, #R511, catching a wire, date and place unknown. 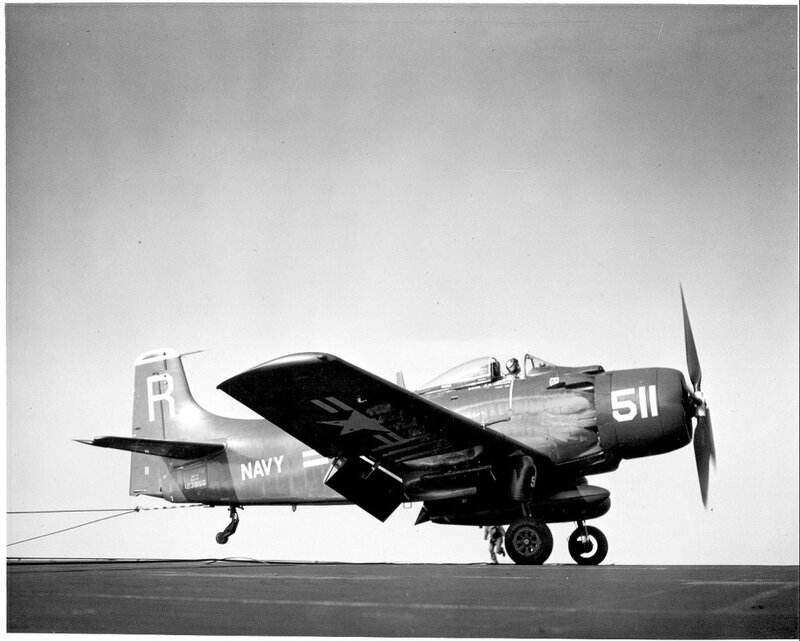 This plane belonged to VA-175 "Hell Razors," part of Carrier Air Group 17 (CVG-17). 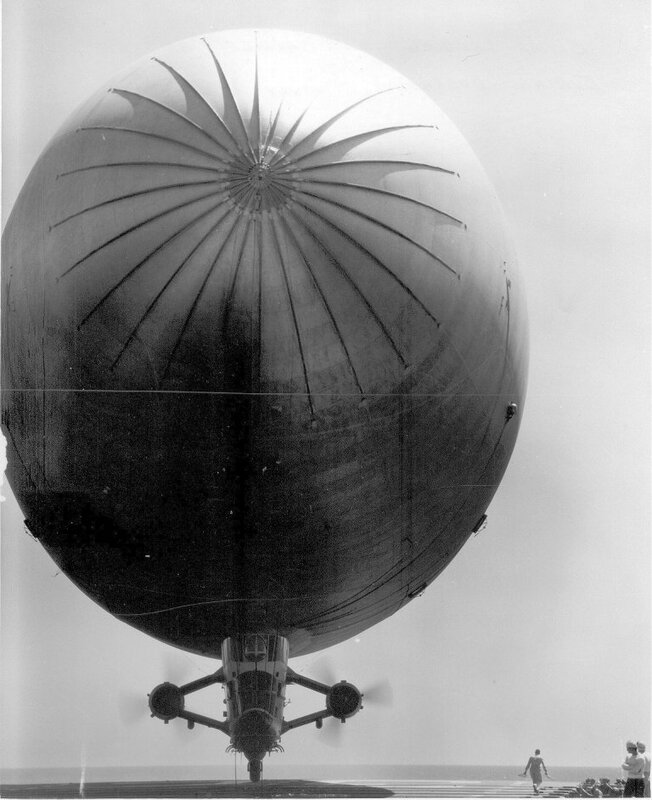 The AD-4W "Guppy" was of special interest to the Bureau of Aeronautics because they had a free swinging tail hook that had the nasty habit of skipping over the wires under certain conditions. 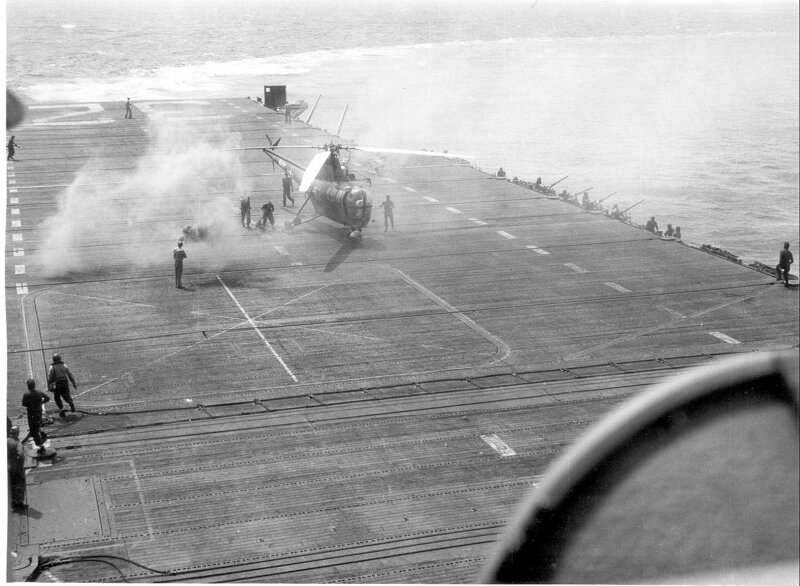 We had to shoot all of their landings up to the point of hook engagement. 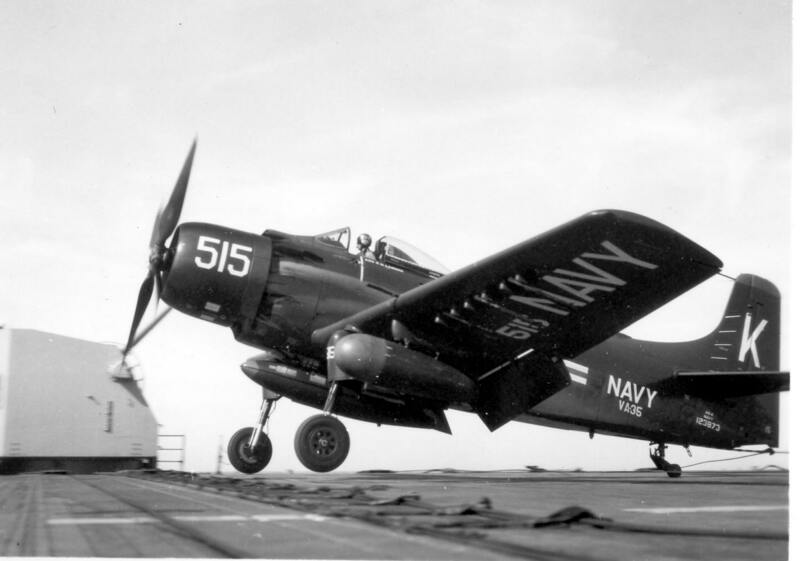 I never saw one go into the barrier but I did see a few catch a wire after a skip or two [LT(JG) Richard G. Greenwood, Annapolis Class of 1949, who identifies himself as the pilot of this AD-4W, does recall a hook-skip]. The plane handlers didn't like to see that happening. 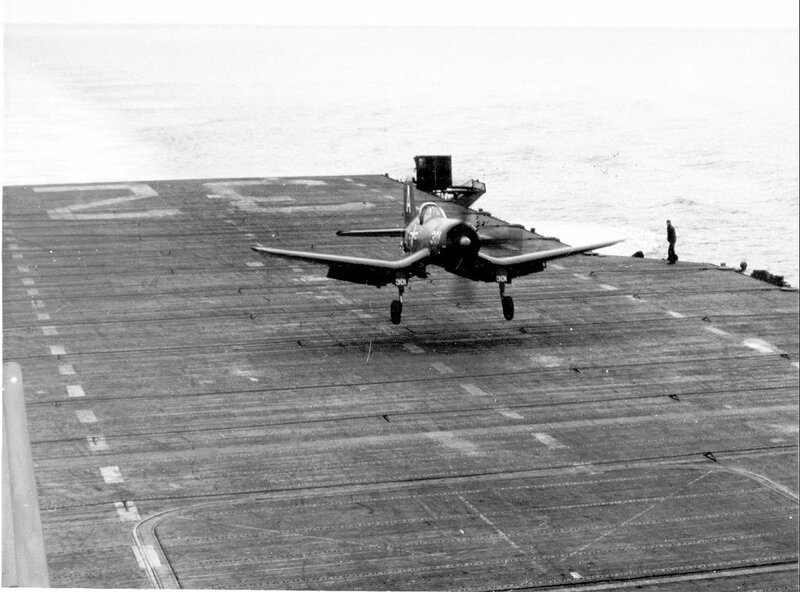 LT(JG) Frank E. "Pat" Patrova, a VC-12 pilot aboard Leyte in 1952, comments: "Pilots called the vertical fins 'Back Scratchers' for the reason that if you had to bail out one of the fins would probably collide with your back." 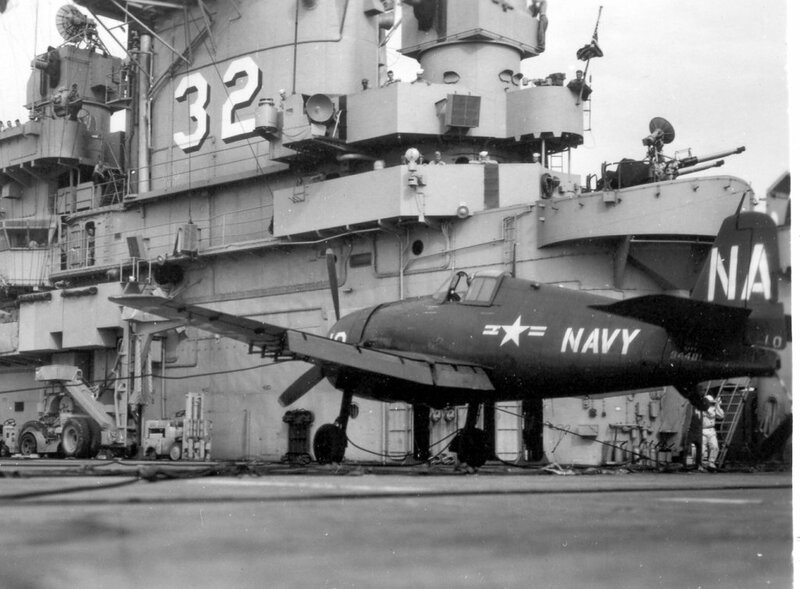 A F2H-2 Banshee about to catch the wire. 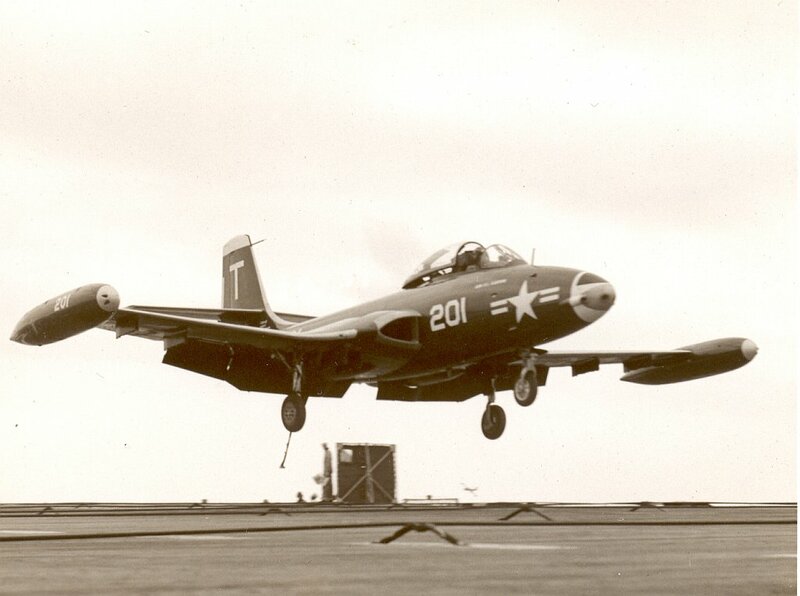 According to its markings, this plane was assigned to Fighting Squadron 12 (VF-12), "Flying Ubangis," part of Air Group 1 (CVG-1) in 1948–1955. 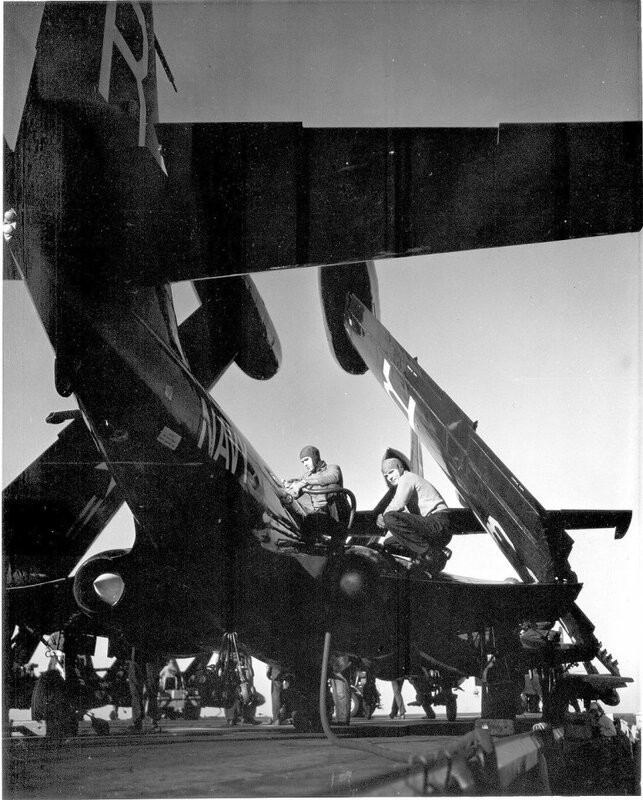 Gassing an F2H-2 Banshee of Carrier Air Group 17 (CVG-17), date and place unknown. 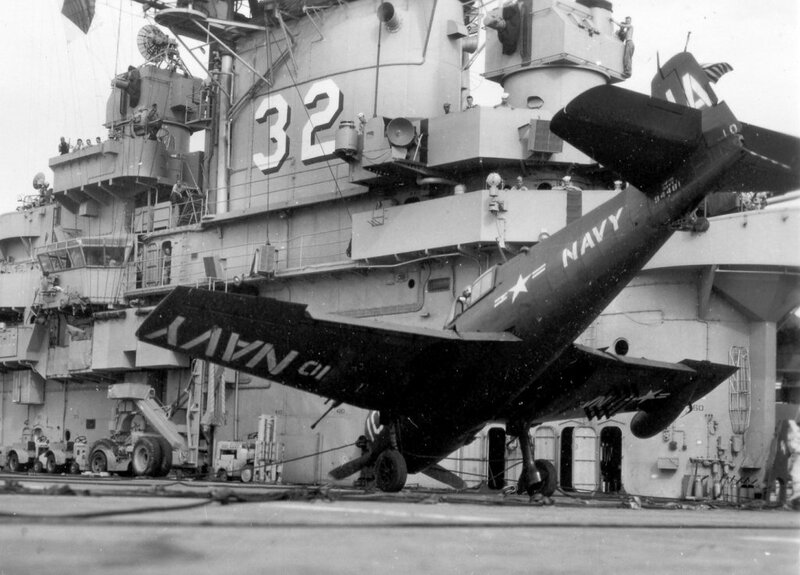 A F2H-2P, the photo version of the Banshee, photographed in April 1952. It carried three cameras in that extended nose. Two were side-looking and the other was vertical. 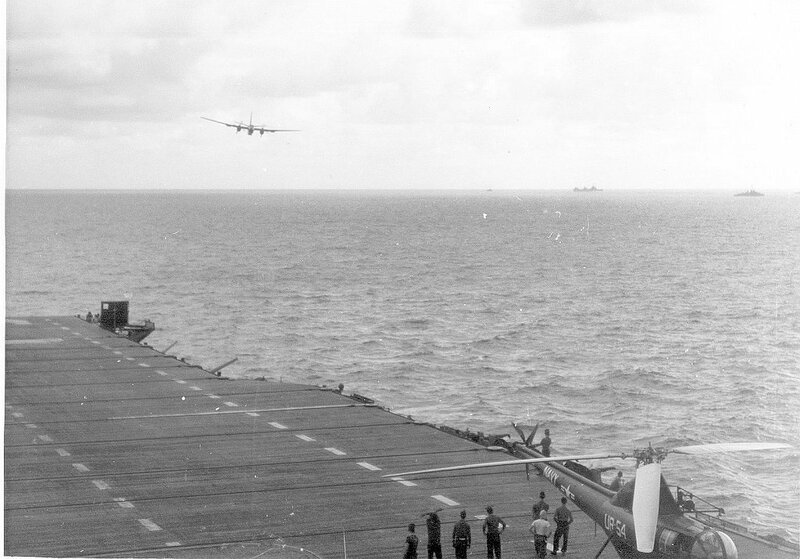 As a little trivia about the Banshee: in heavy seas the planes came in high and cut power and dropped like stones onto the deck. I saw a Banshee drop down and have both wheel struts come completely through the wings. 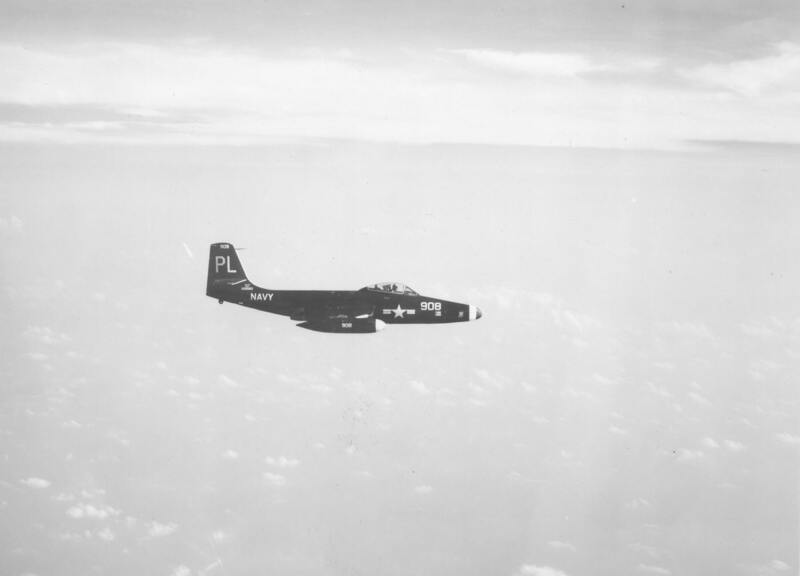 An air to air shot of a F2H-2P Banshee assigned to Composite Squadron 62 (VC-62) "Fighting Photos." 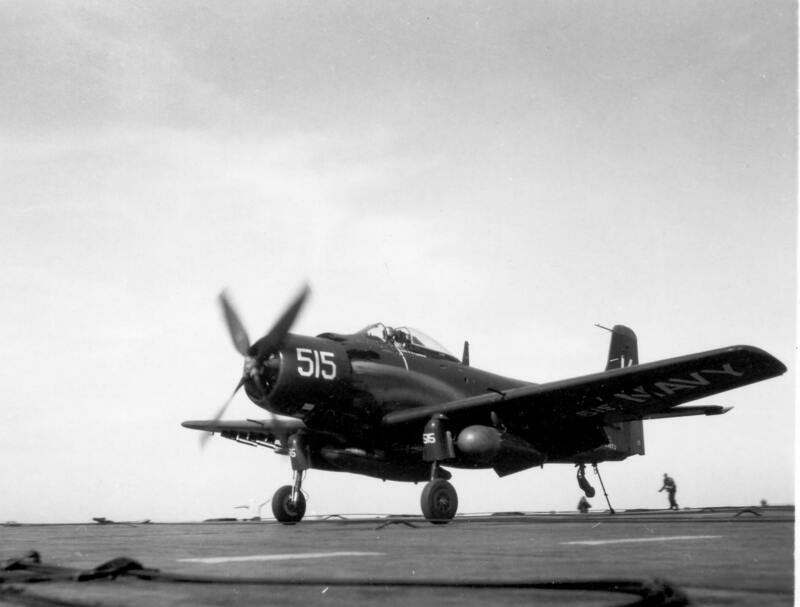 F4U Corsair, #A-301, landing. Date and place unknown. 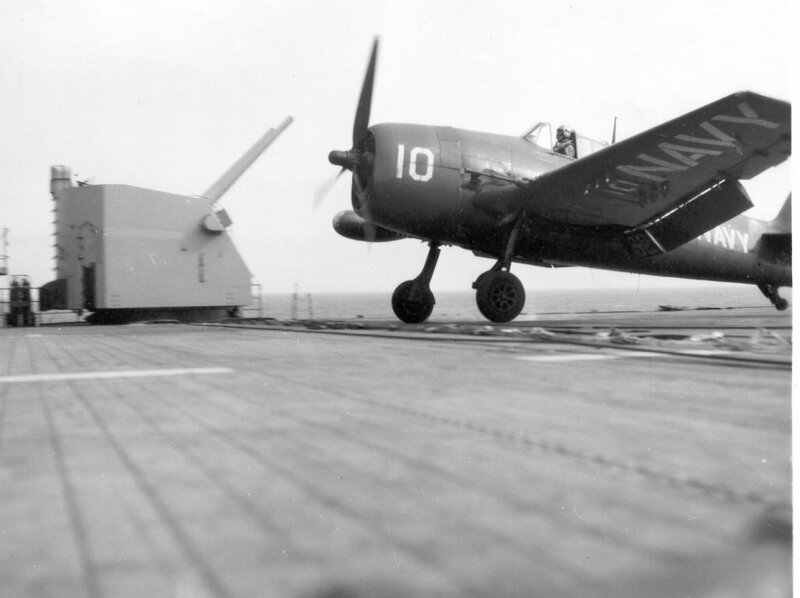 F4U Corsair, #K-314, in barrier. Date and place unknown. 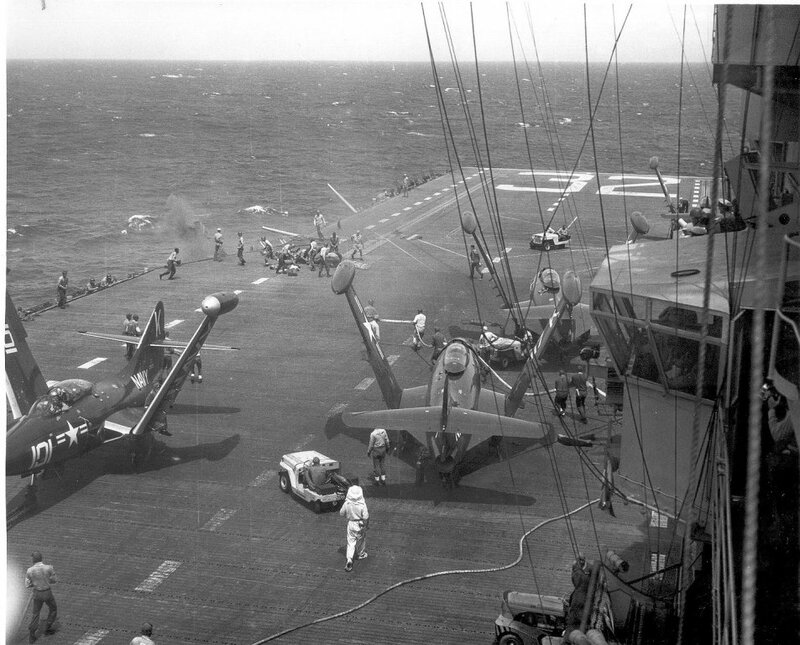 F4U Corsairs of Carrier Air Group 17 (CVG-17) on flight deck, circa 1951. Plane closest to camera is F4U-4 BuNo 82026. 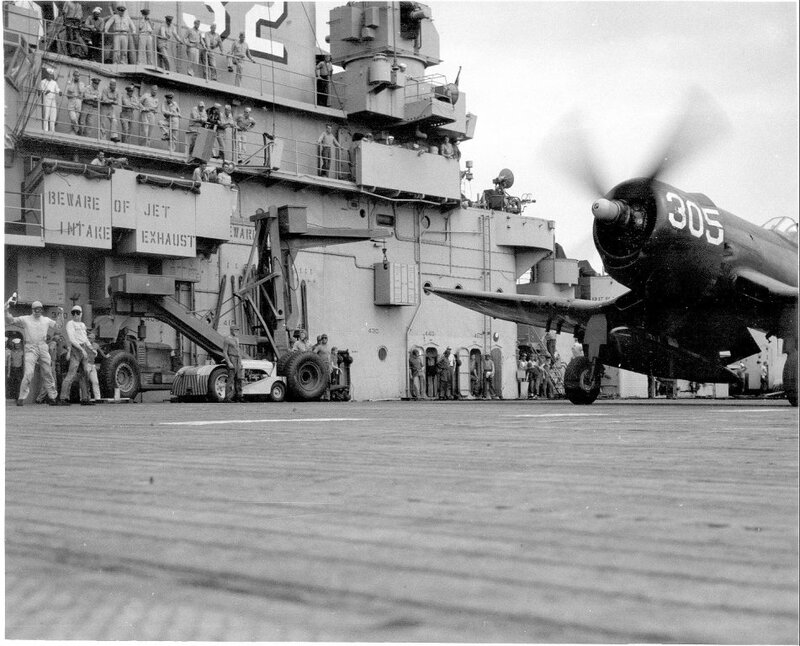 F4U Corsairs of Carrier Air Group 17 (CVG-17) about to take off. 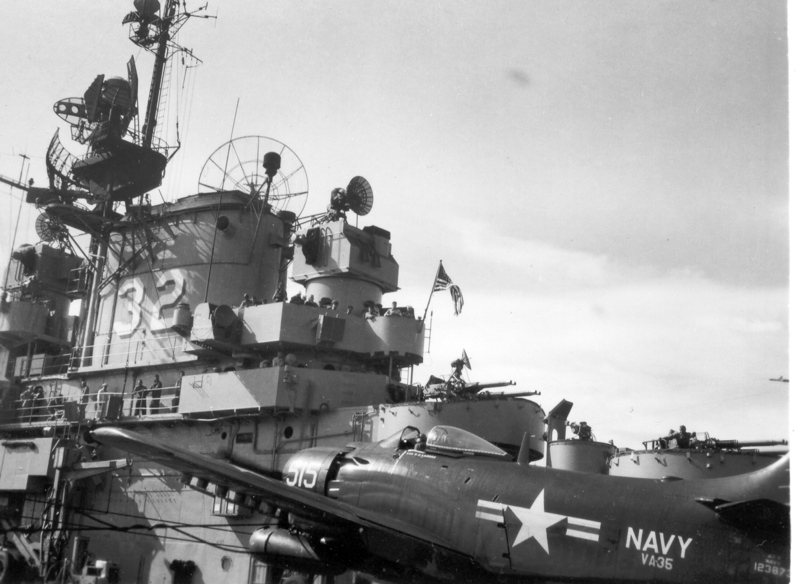 CVG-17 (established as CVG-82 in April 1944, redesignated CVAG-17 in November 1946 and CVG-17 in September 1948) deployed twice with USS Franklin D. Roosevelt in 1951–1952, and never deployed overseas aboard Leyte. 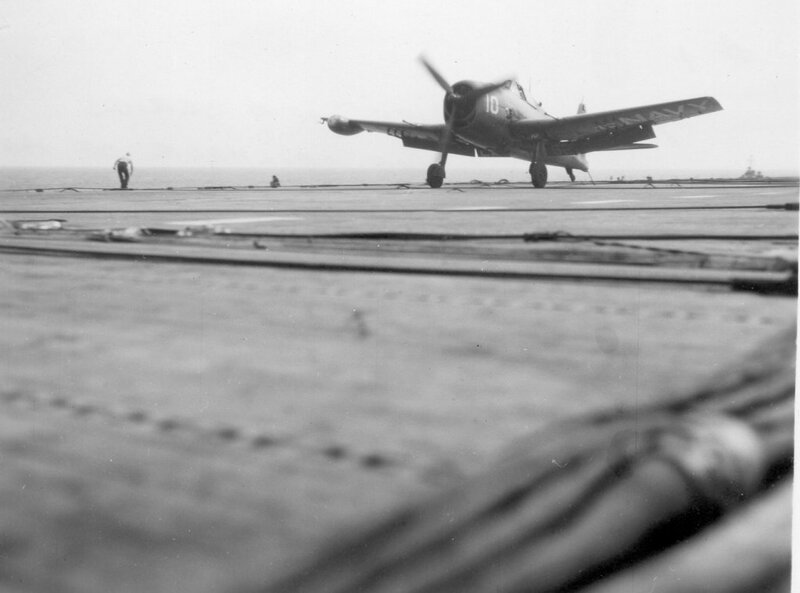 F4U Corsair, side number 305, moving toward catapult. Location and date unknown. 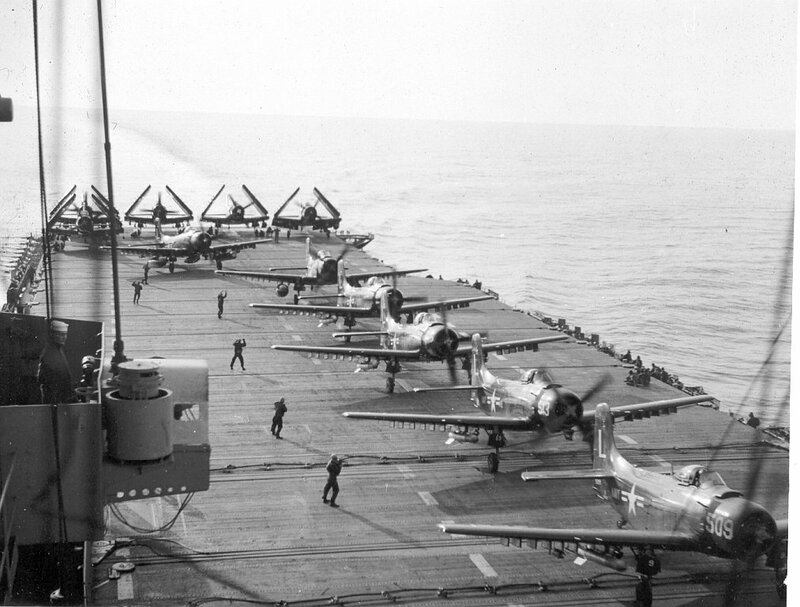 A deck full of F4U Corsairs and F8F Bearcats. Location and date unknown, but probably 1951. 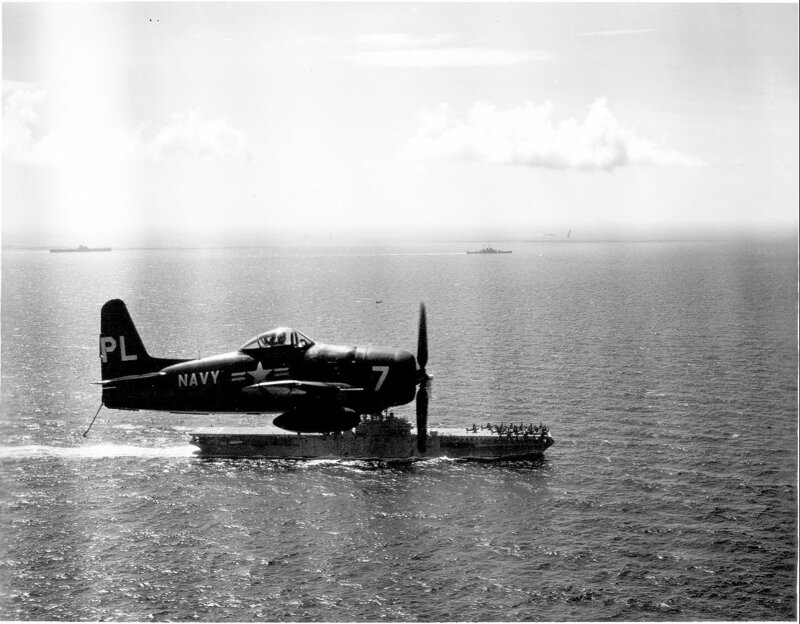 F8F-2P Bearcat of Composite Squadron 62 (VC-62) above USS Leyte. A heavy cruiser and a Midway-class aircraft carrier steam in the background. Possibly taken in 1951. 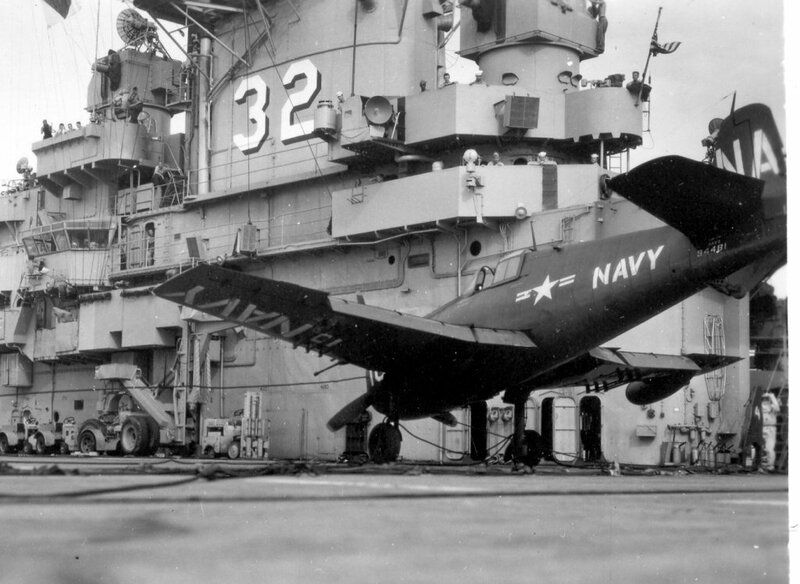 F9F-2 Panther #A-122 landing, date and place unknown. 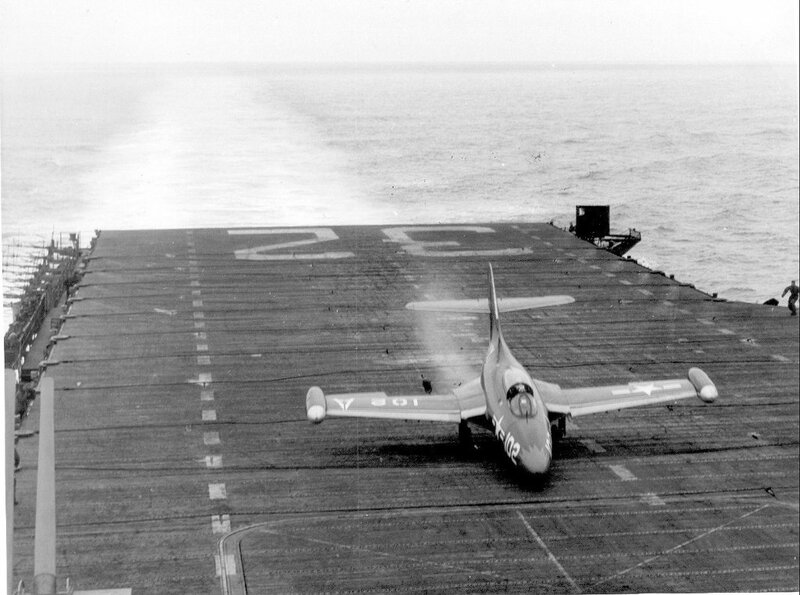 Note jet barrier in position. 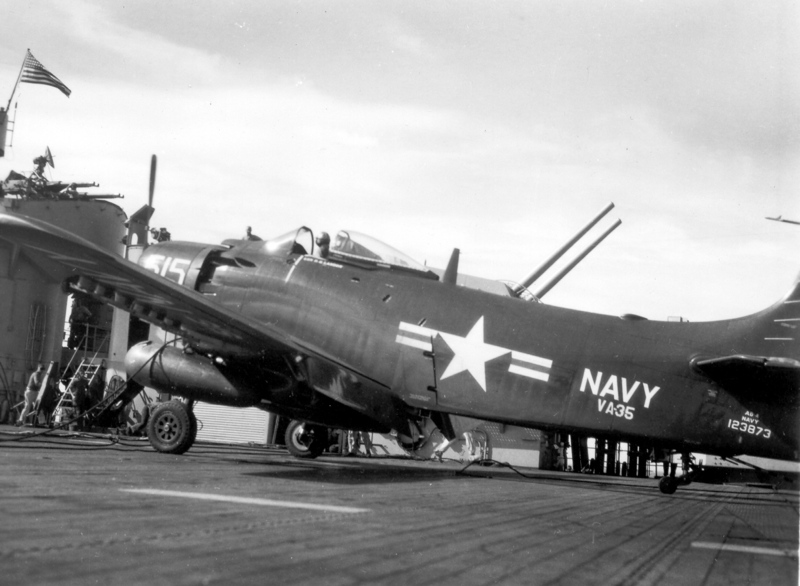 This plane was assigned to VF-721 "Iron Angels," a reserve squadron called to active duty on July 20, 1950, and part of Carrier Air Group 101 (CVG-101.) 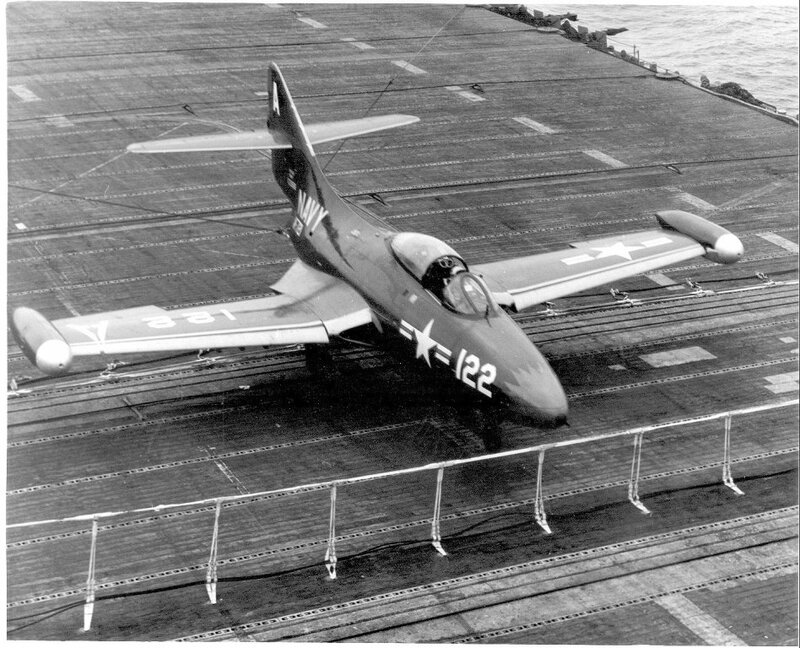 On February 4, 1953 VF-721 was redesignated VF-141, and CVG-101 was redesignated CVG-14. 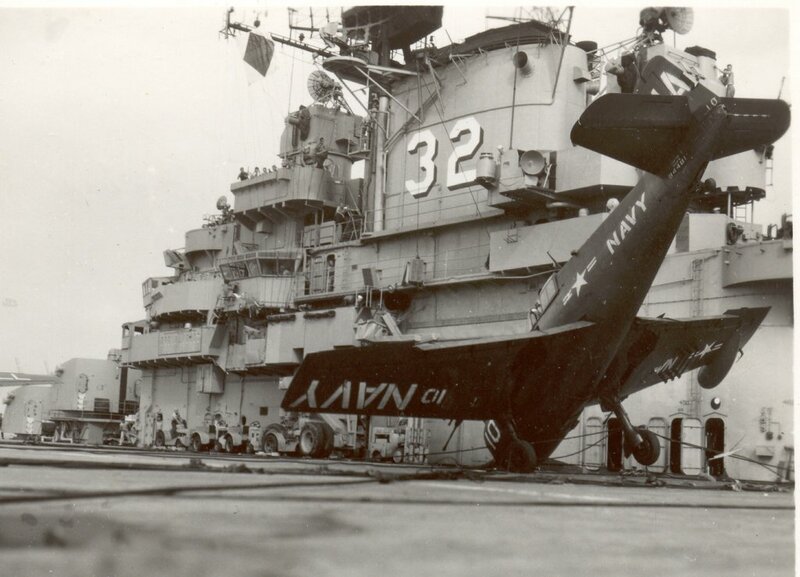 Another F9F-2 Panther of VF-721, #A-102 landing and losing its nose wheel, date and place unknown. 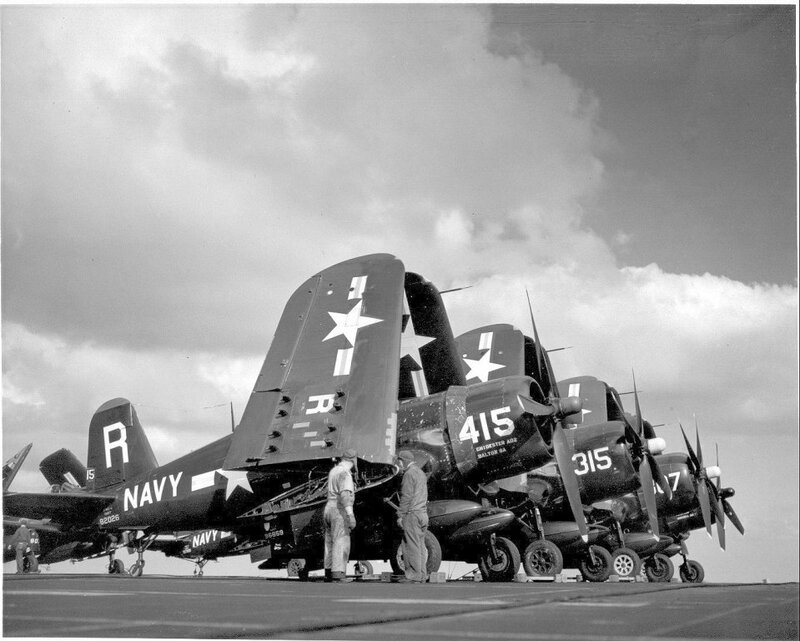 F9F-2 Panthers of Carrier Air Group 3 (CVG-3), location and date (1950–1951?) unknown. Overflight by 2-engine aircraft, date and place unknown. 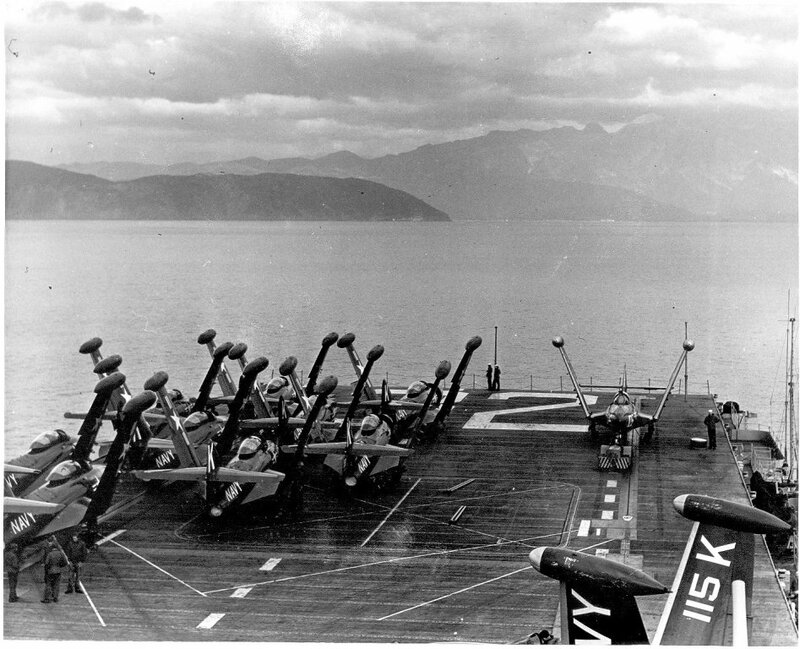 Note HU-2 "Fleet Angels" HO3S-1 helicopter on deck. 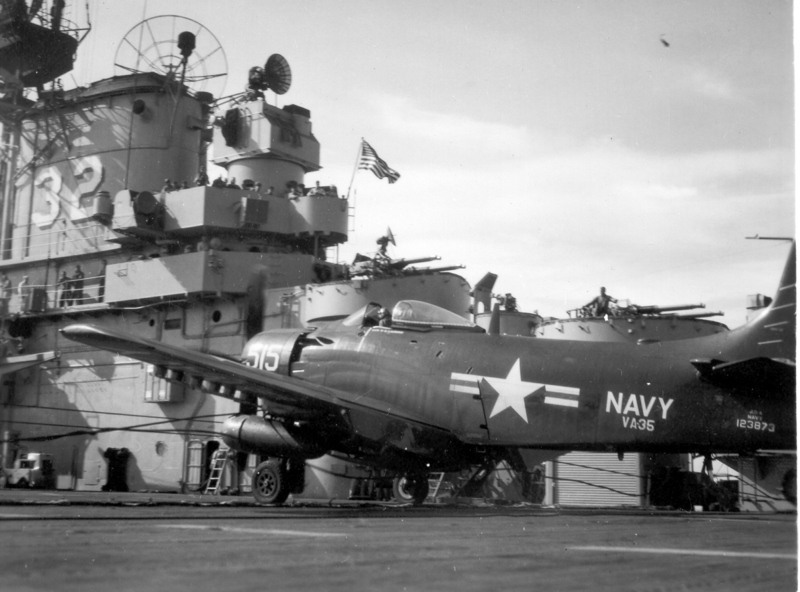 This appears to be just a simulated flight deck accident. 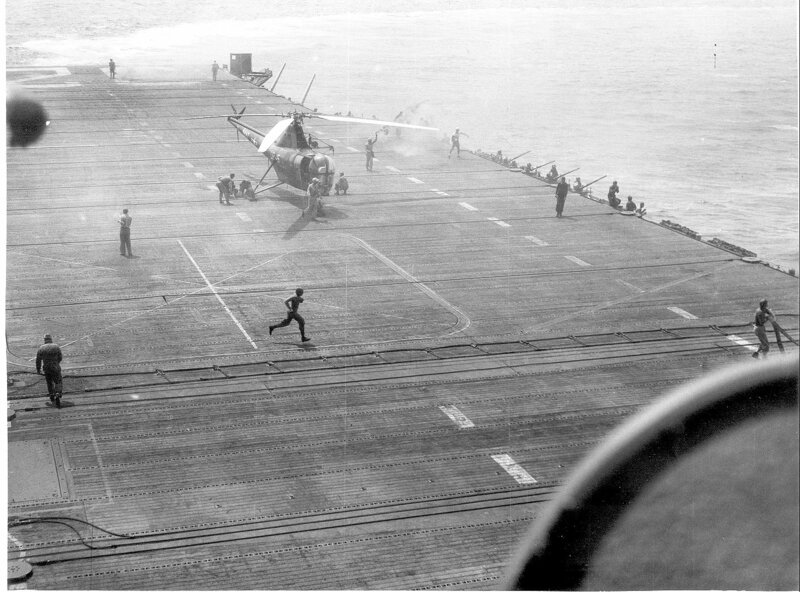 But working on the flight deck is indeed a dangerous job! 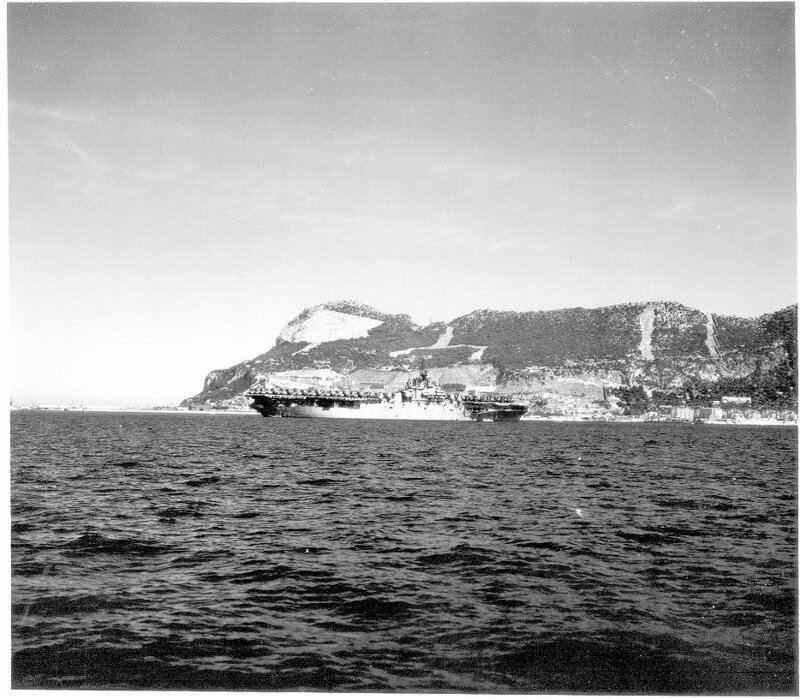 Gibraltar, September 1952: USS Leyte (CV-32) nicely framed by some trees. 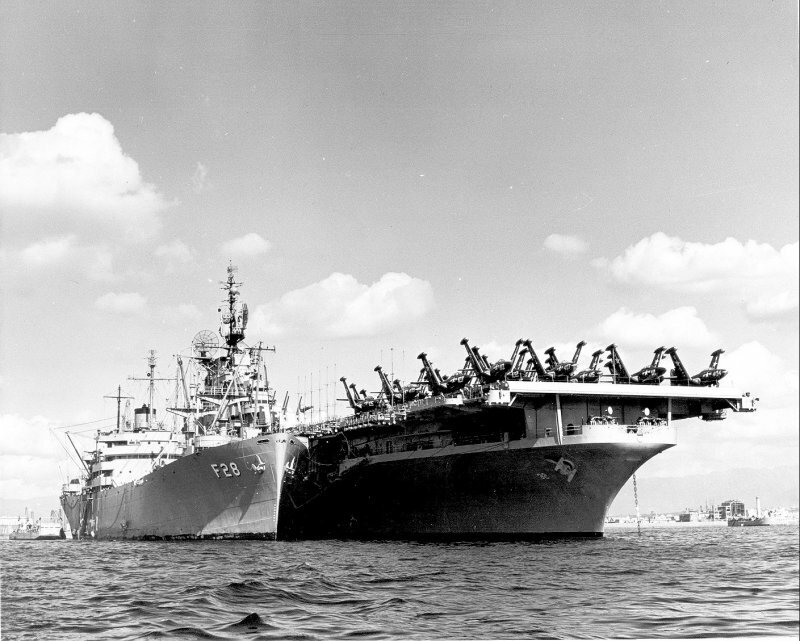 USS Hyades (AF-28) and USS Leyte (CV-32) at anchor, circa 1950–1952. Location unknown. 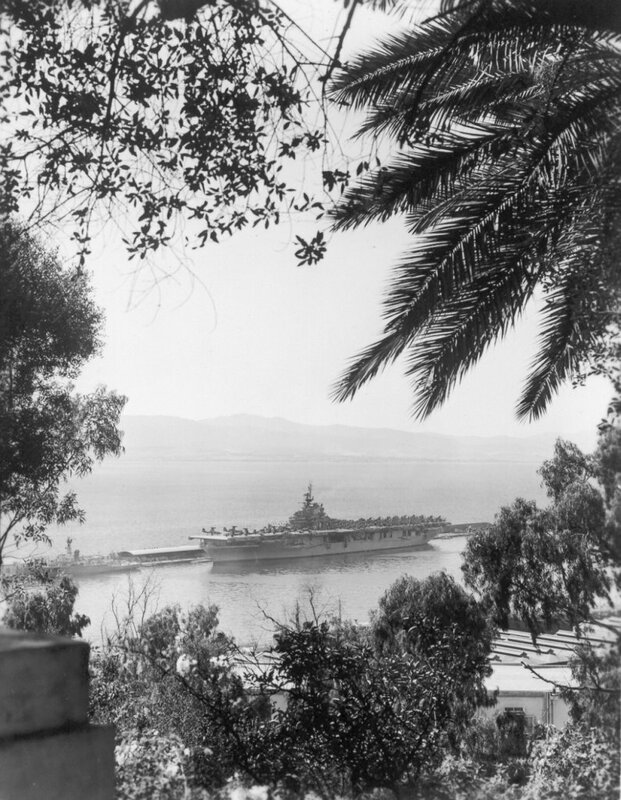 USS Leyte (CV-32) at anchor, date and location unknown. 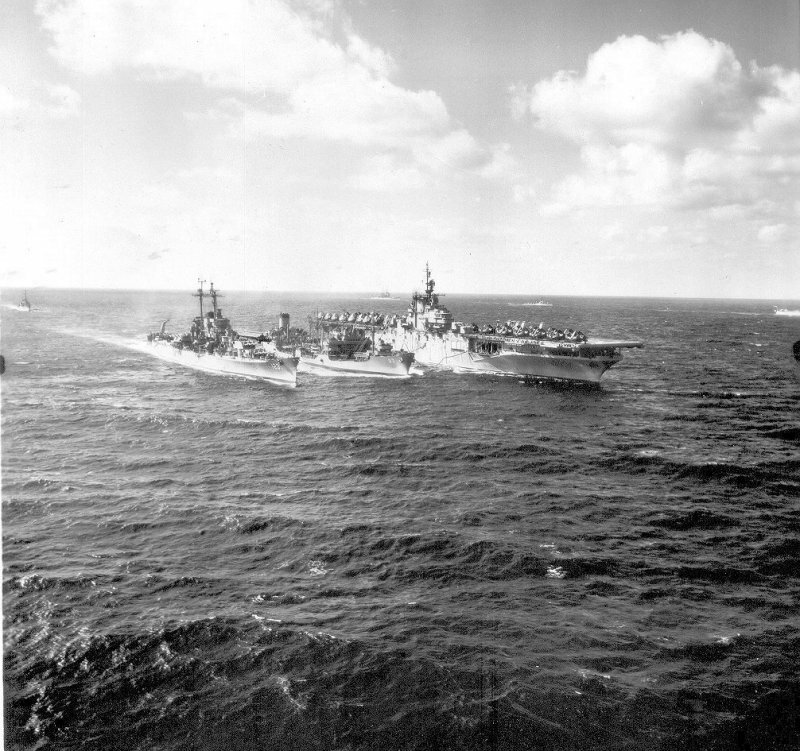 USS Leyte (CV-32) underway, date and location unknown. 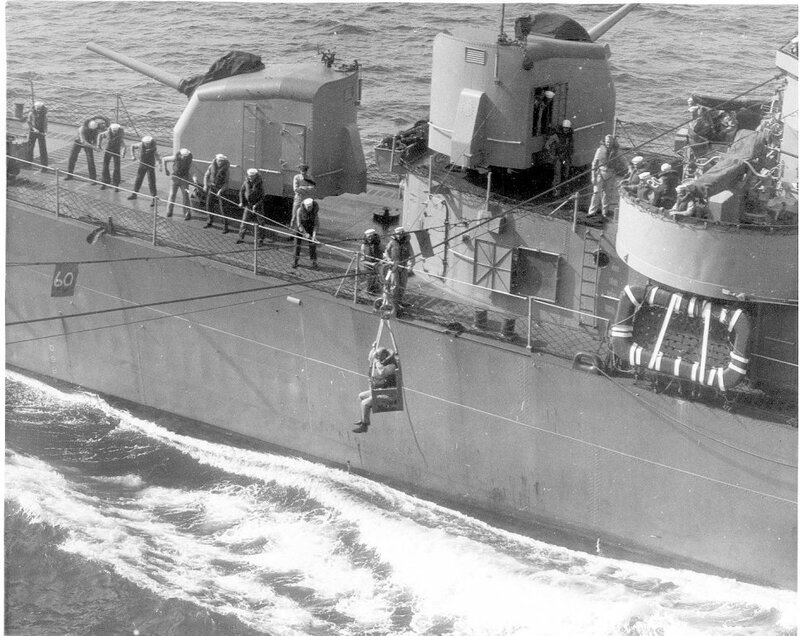 Taking a man aboard from an unidentified destroyer, via high line. Date and place unknown. 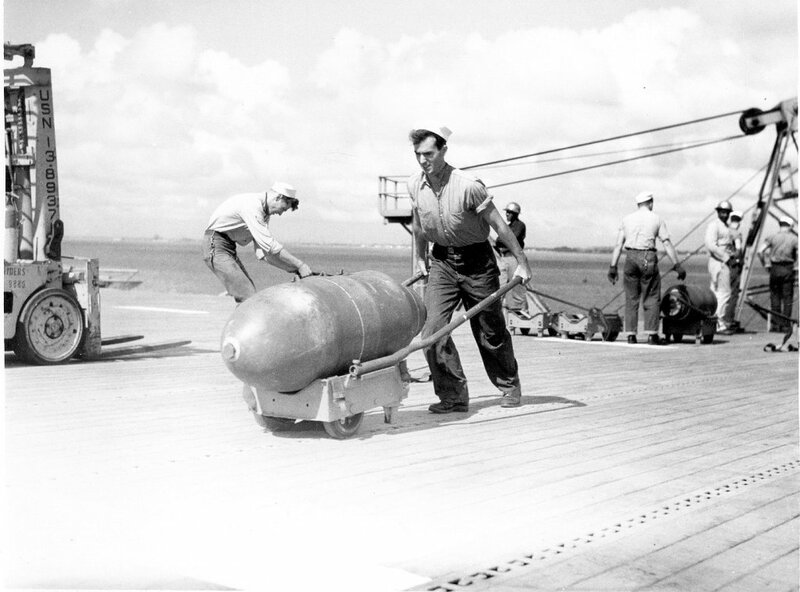 Loading a 1,000lb aerial bomb, 1952. Norfolk, Va.
Air defense drill at sea. Date unknown, but probably 1951. Taking on provisions in port, probably fresh fruit and vegetables. 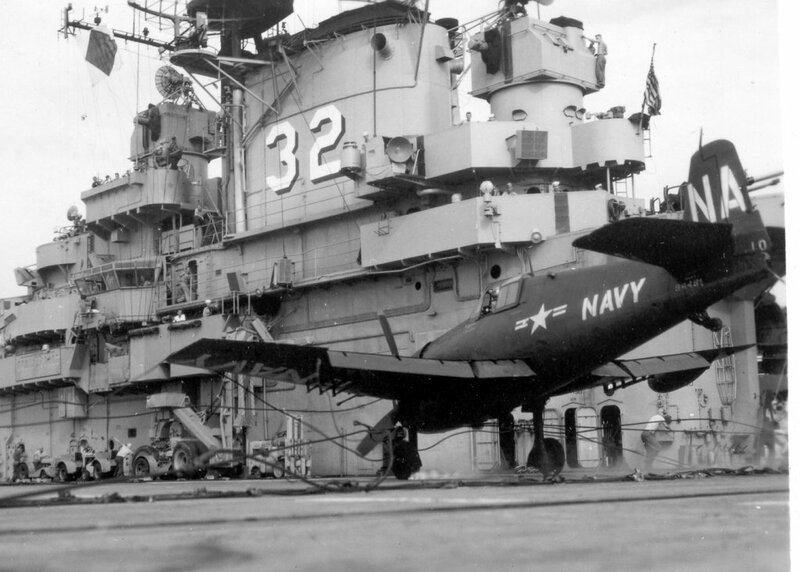 Note LCM from Oglethorpe (AKA-100) alongside, AD Skyraiders from VC-33 (tail code "SS") and VC-12 ("NE") parked on the flight deck.